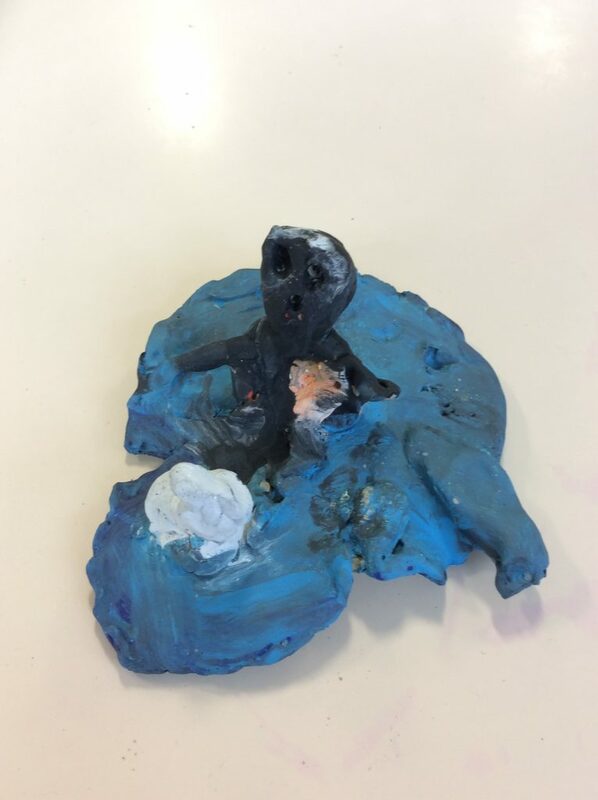 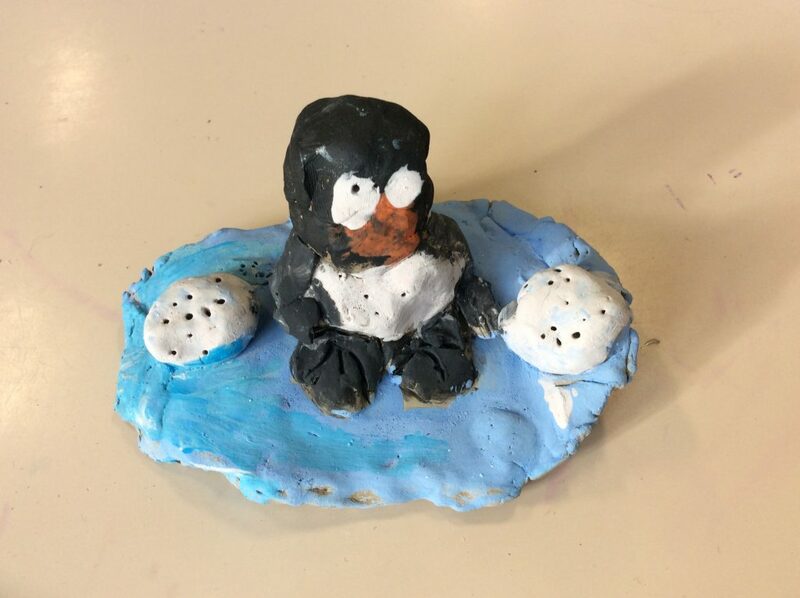 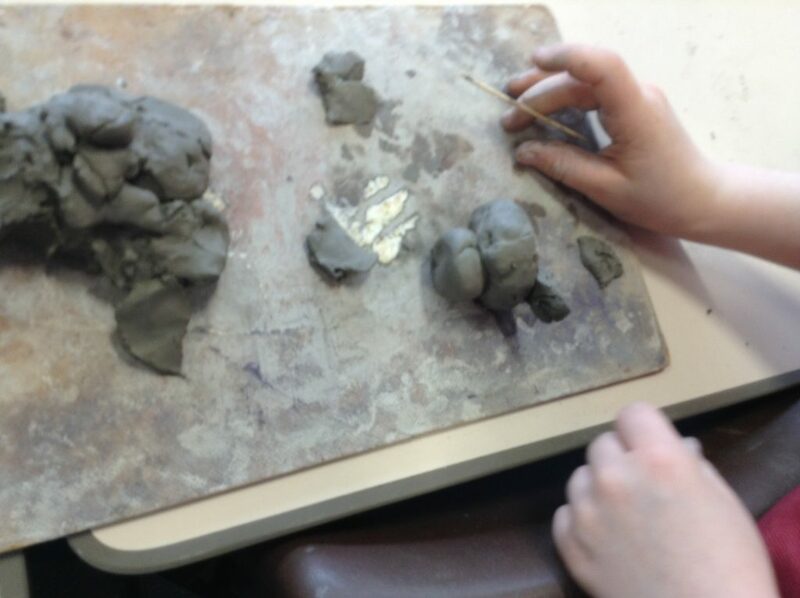 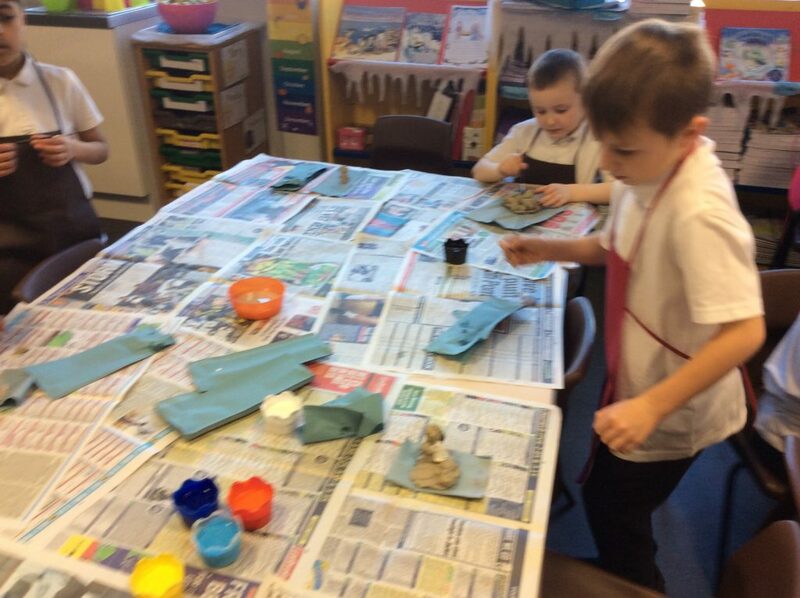 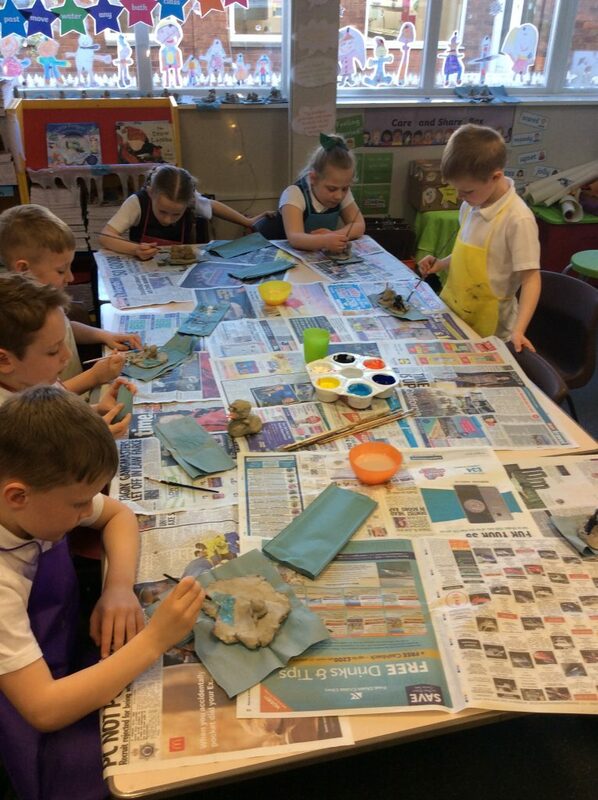 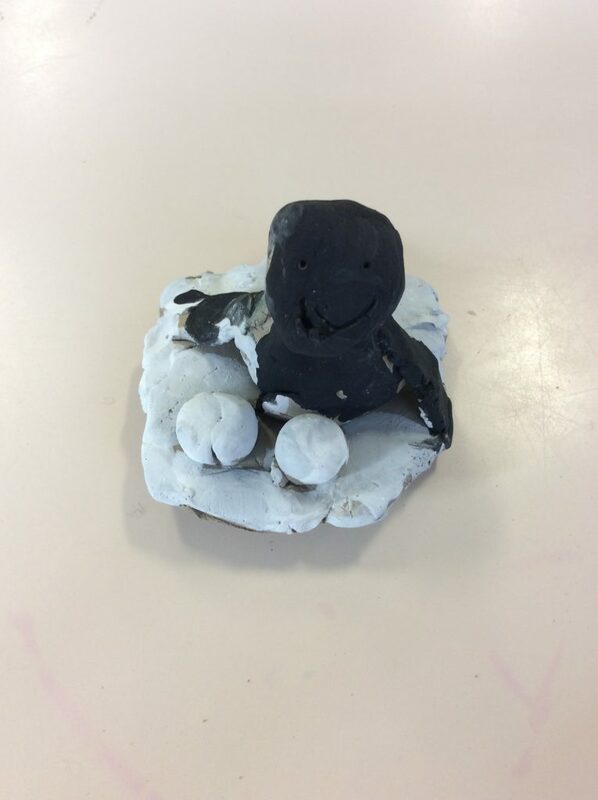 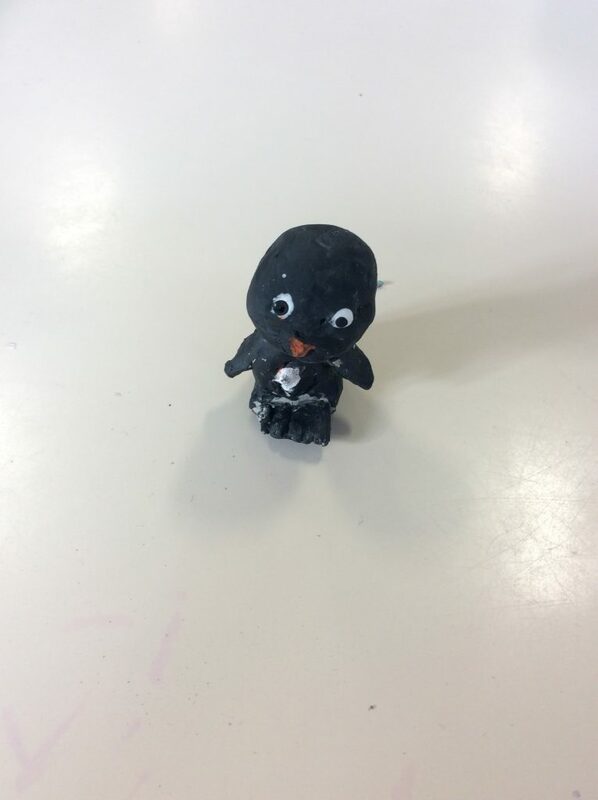 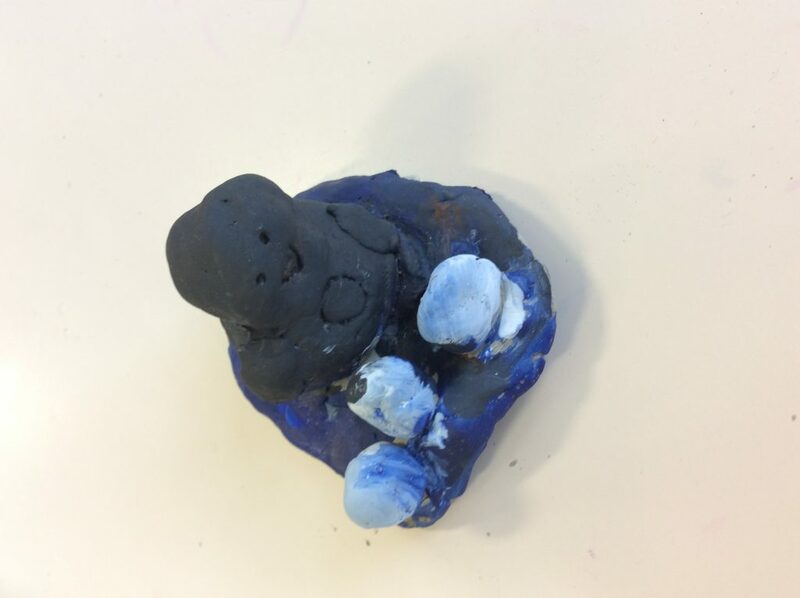 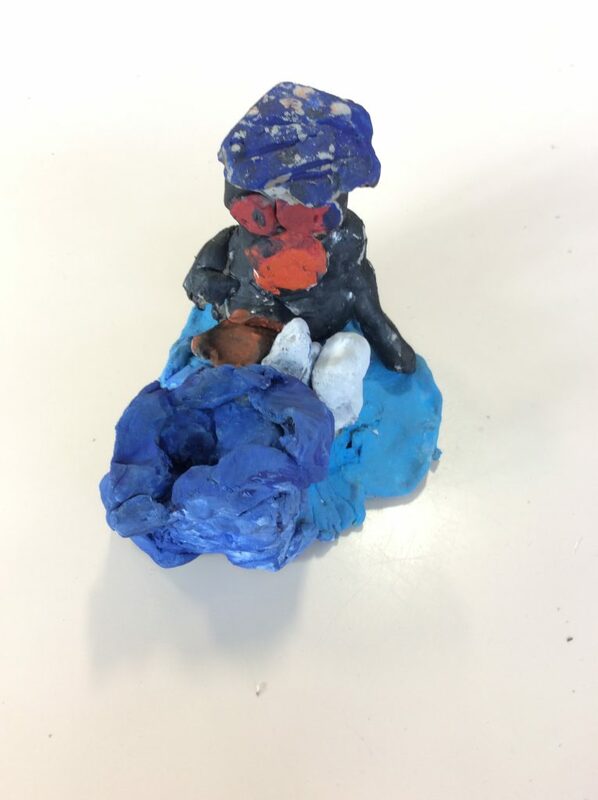 We have been making clay penguins! 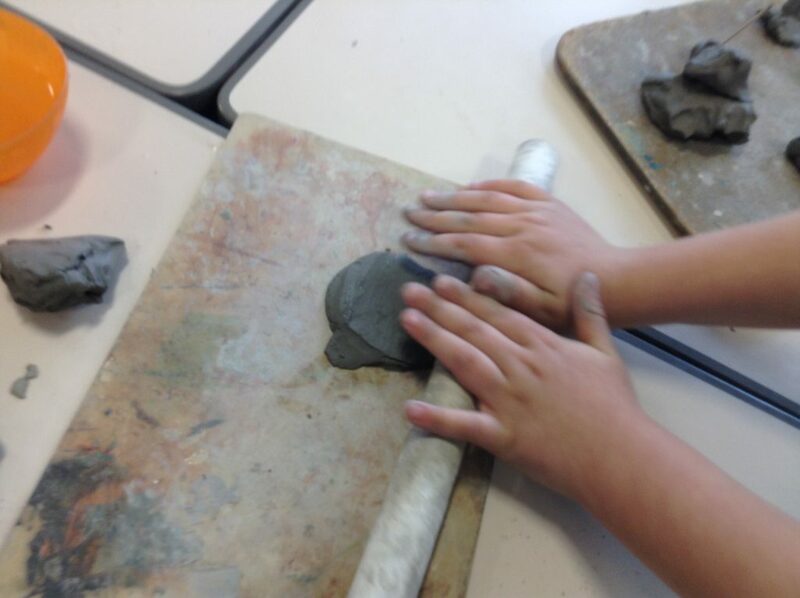 We learnt how to mold and shape clay, using water to make sure the clay stays hydrated. 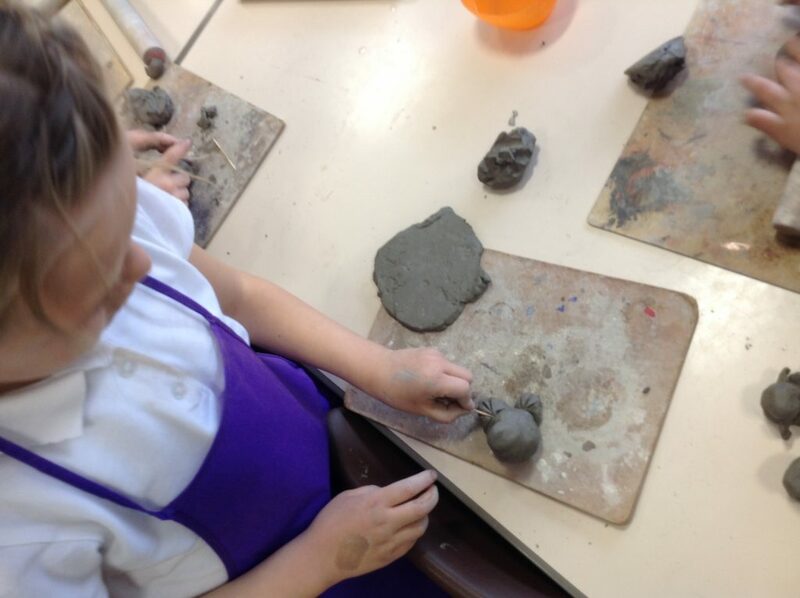 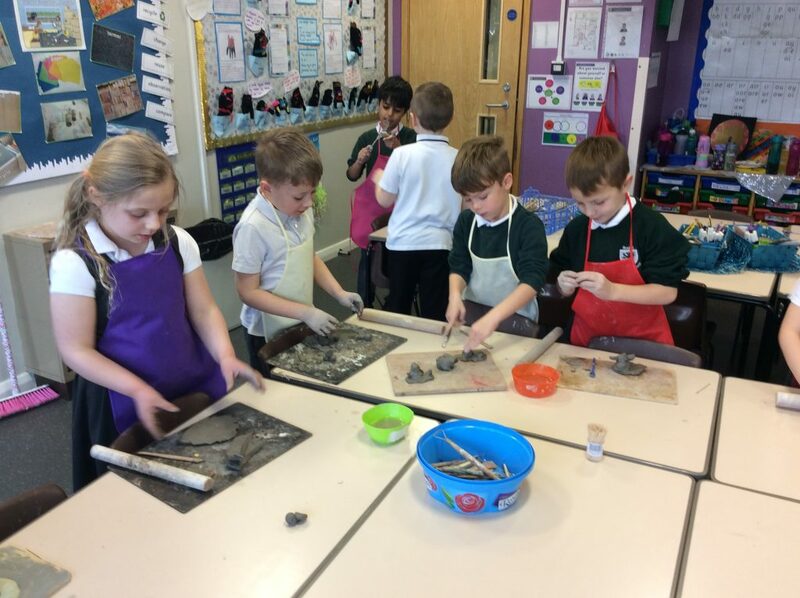 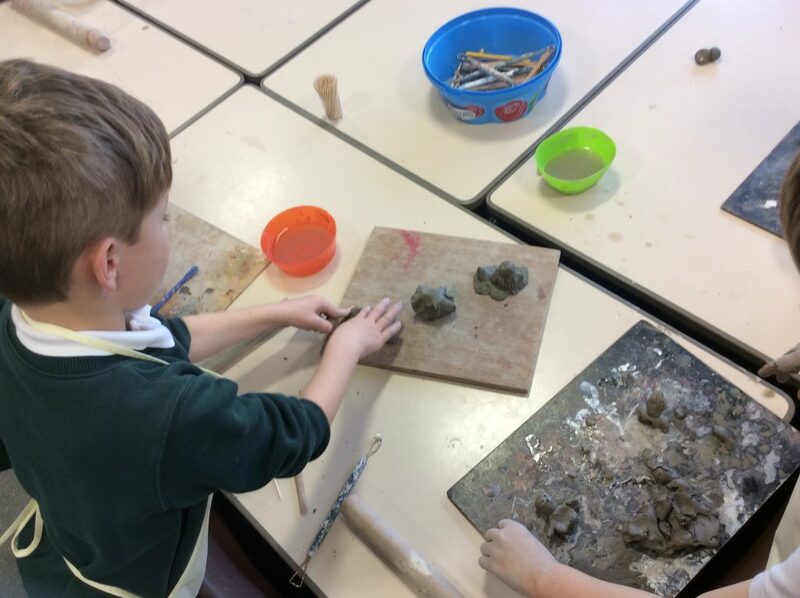 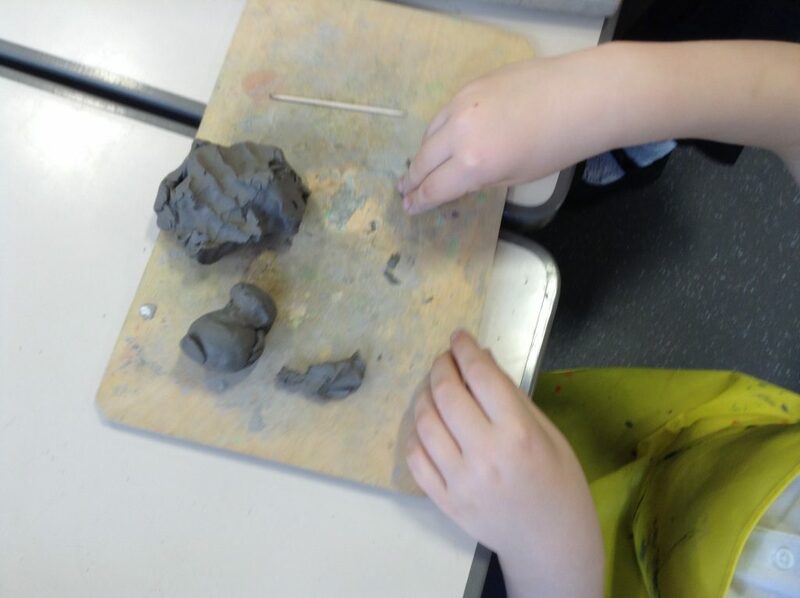 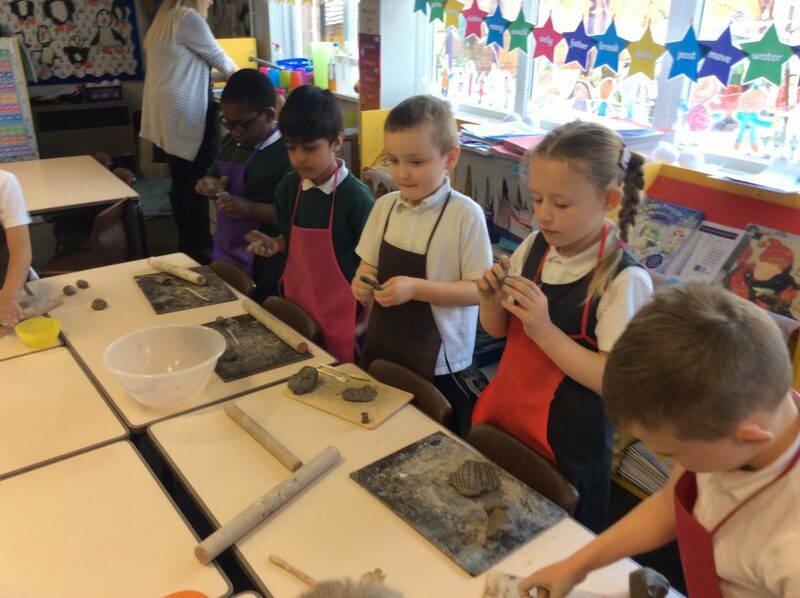 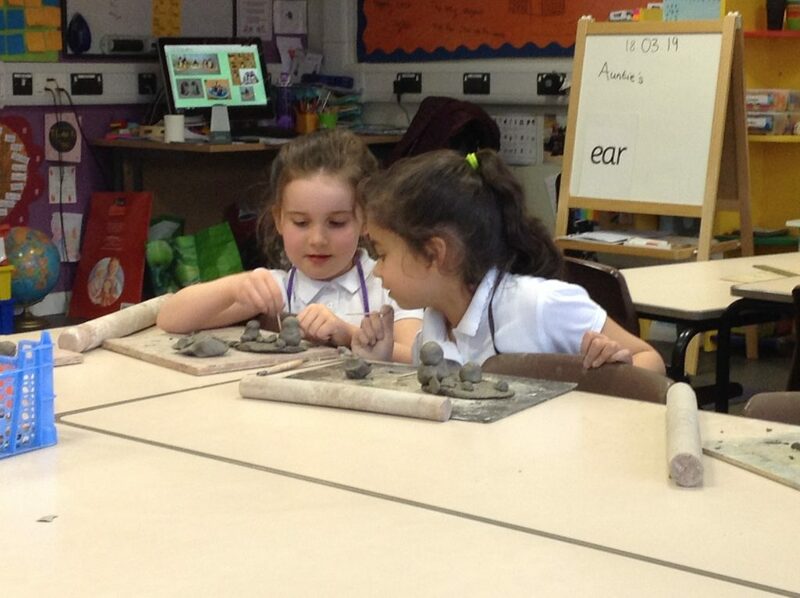 We practised joining pieces of clay to make sure they will not fall apart when they are dry! 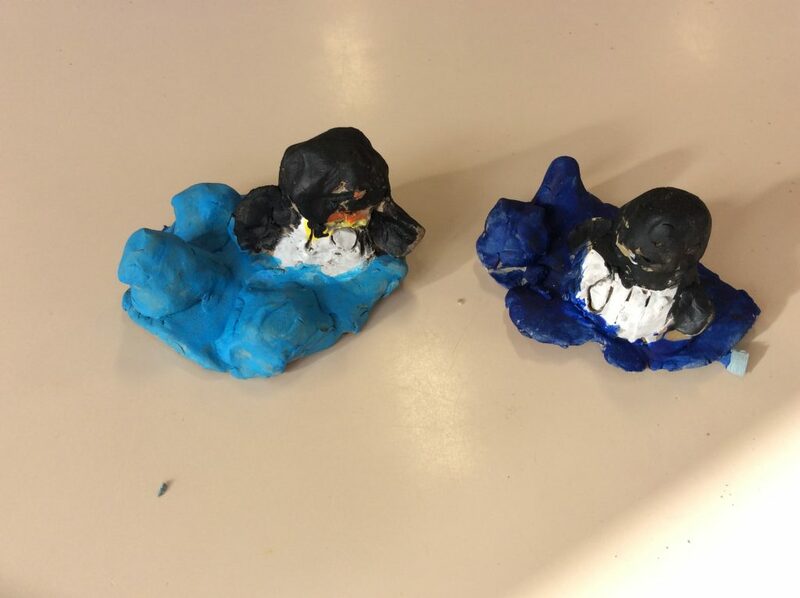 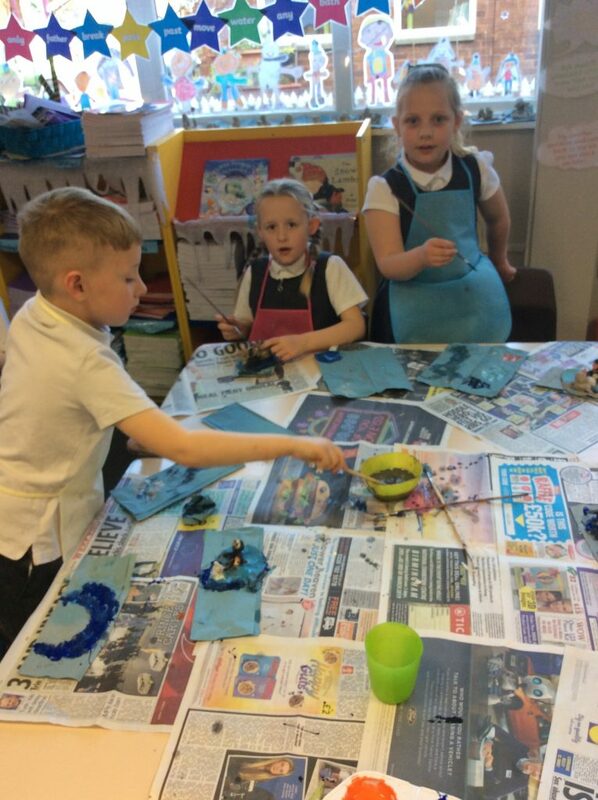 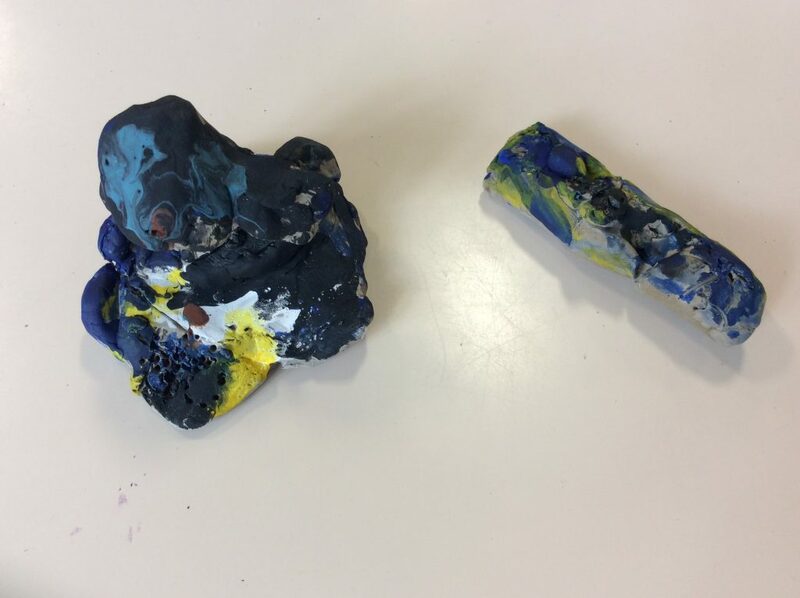 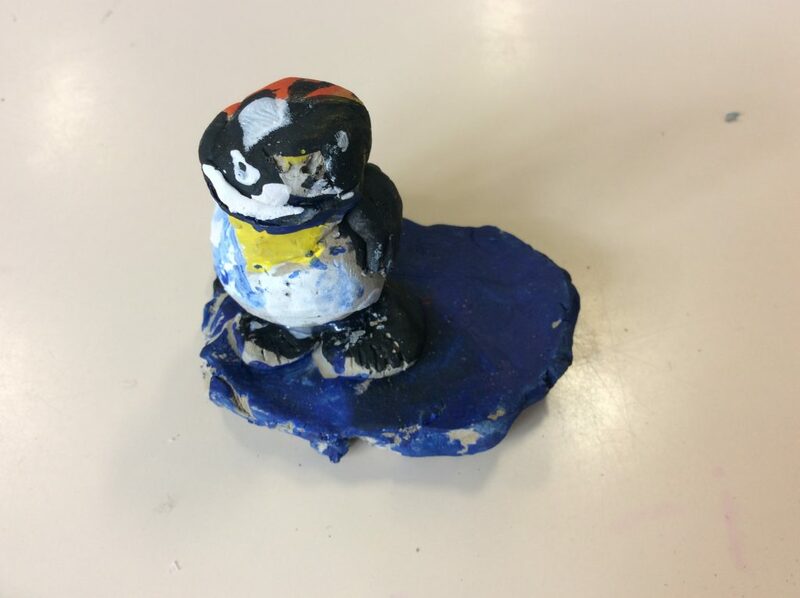 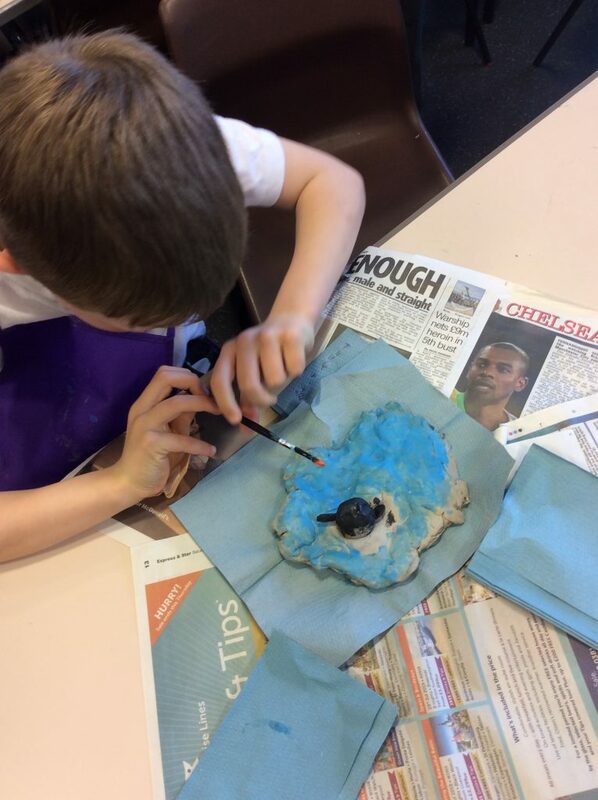 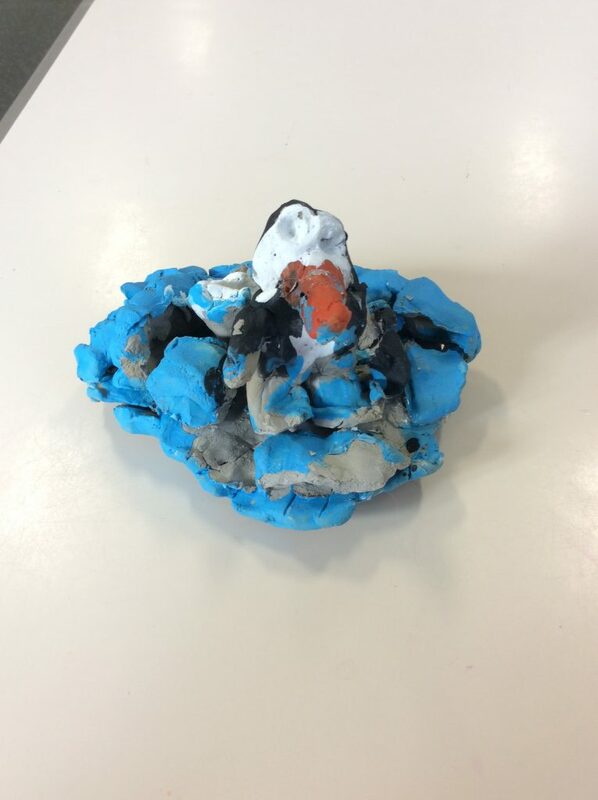 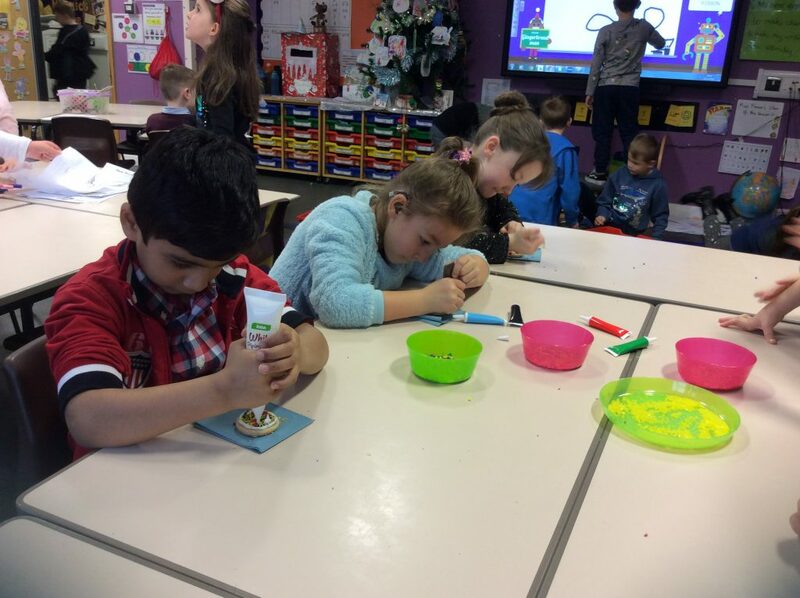 When our penguins were dry, we mixed different colours with glue to paint our penguins. 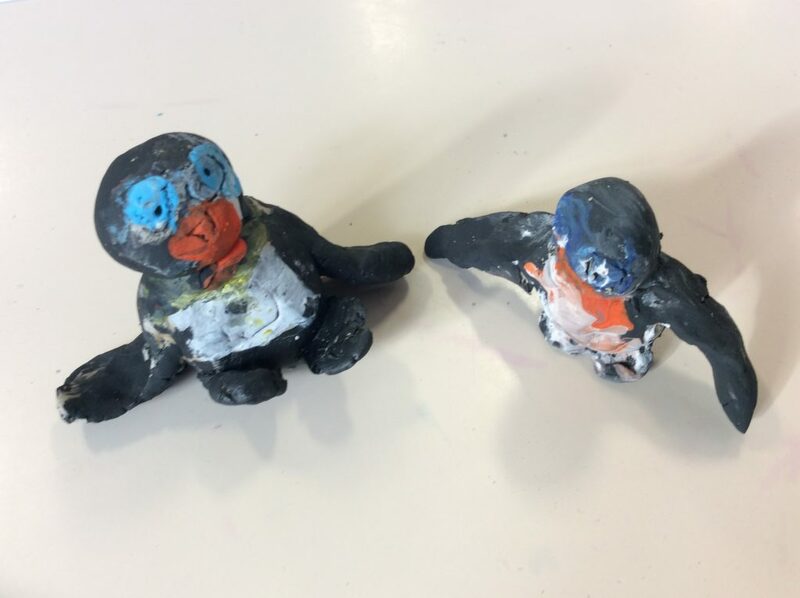 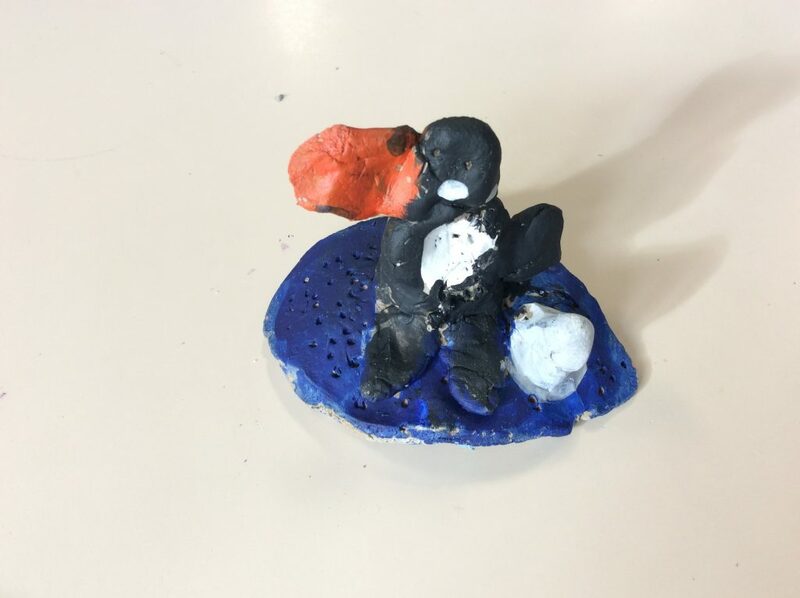 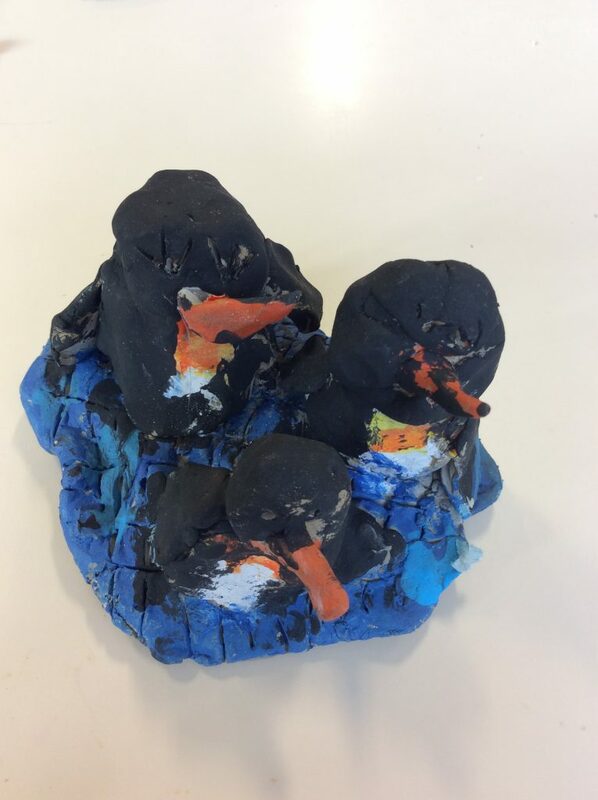 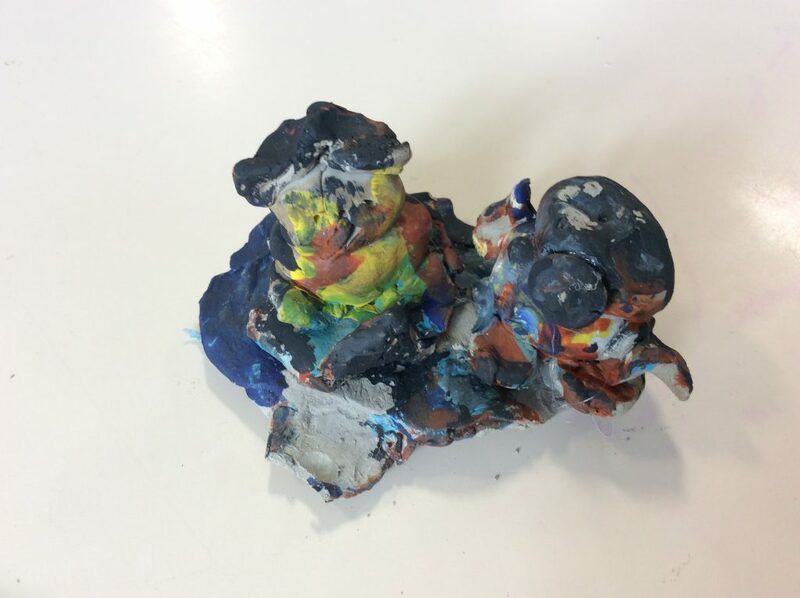 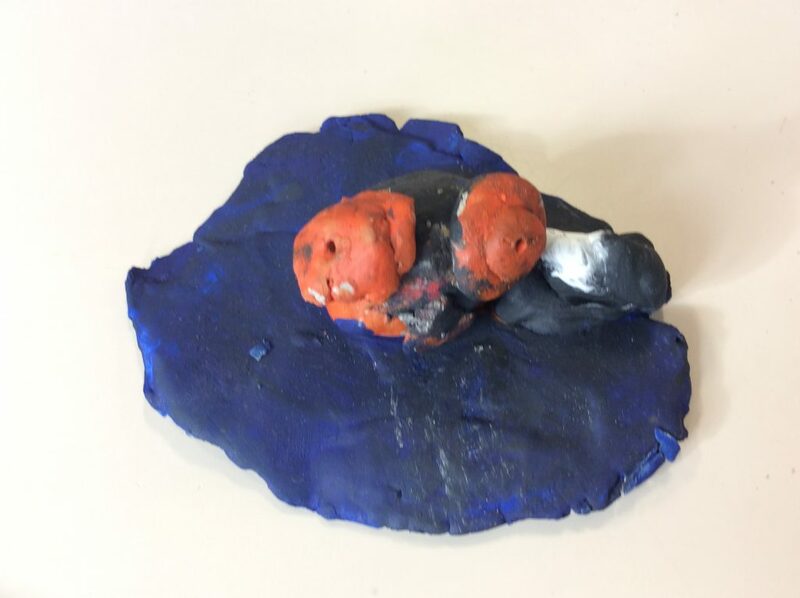 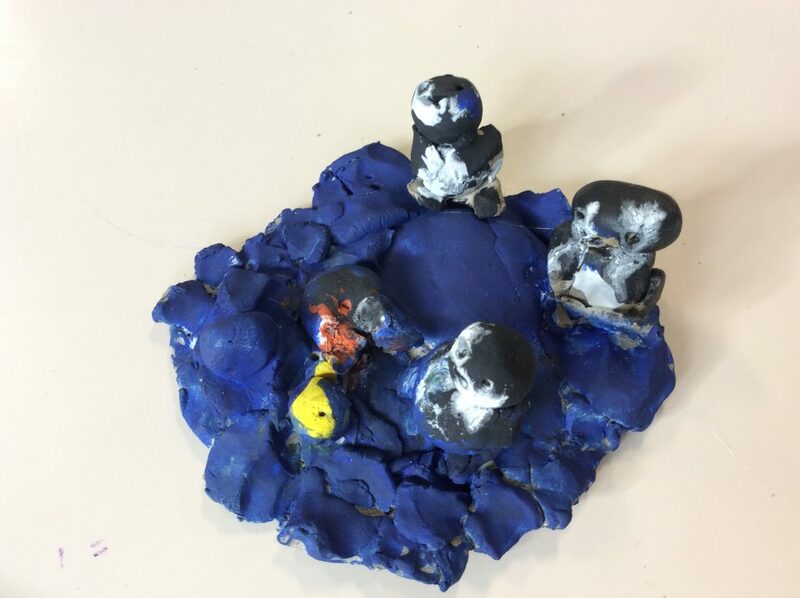 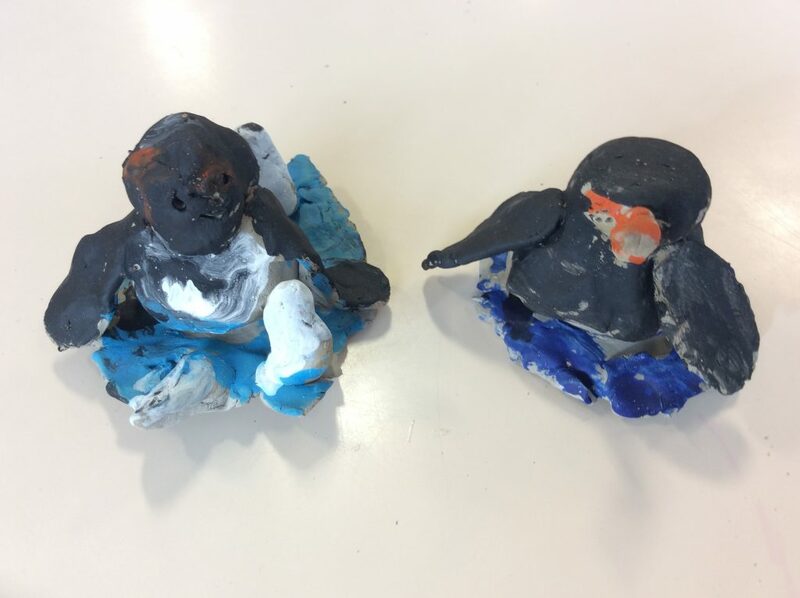 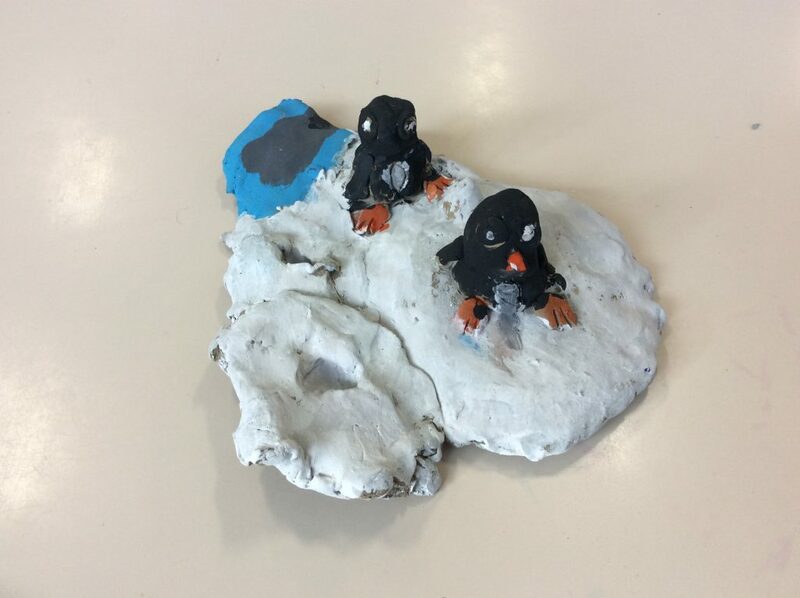 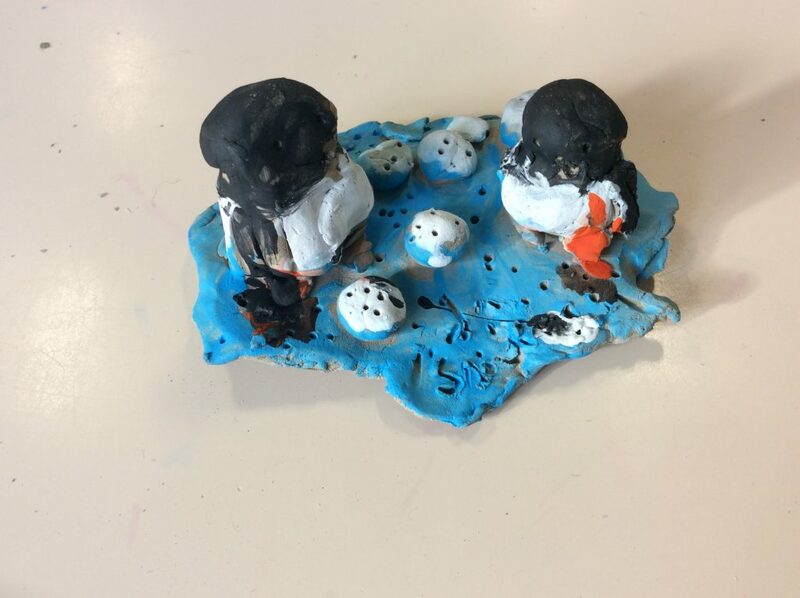 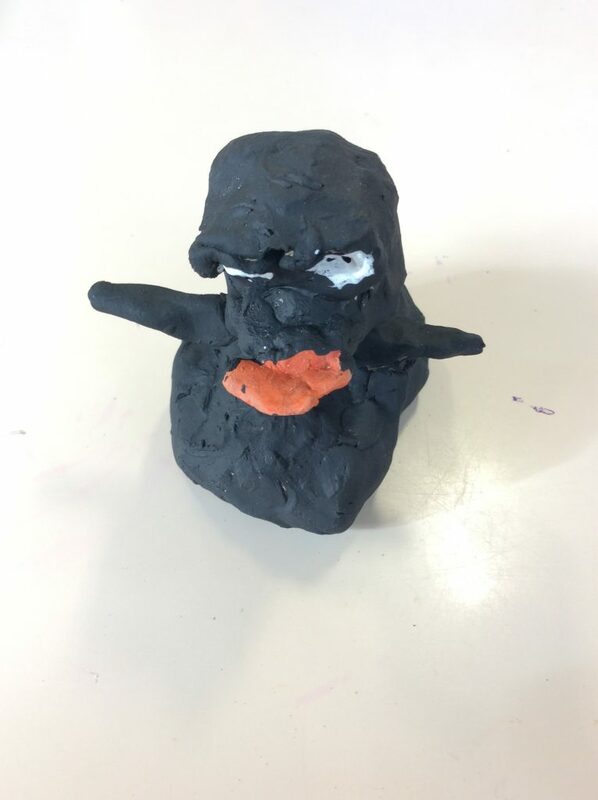 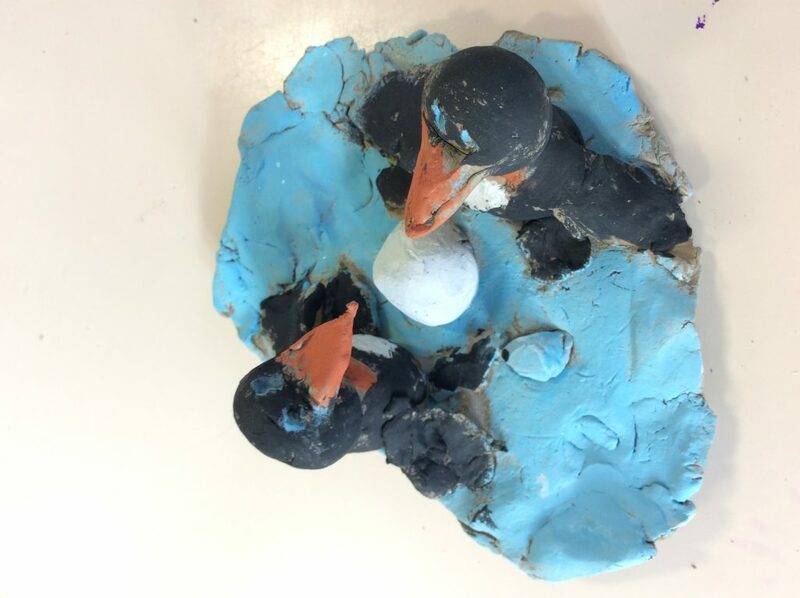 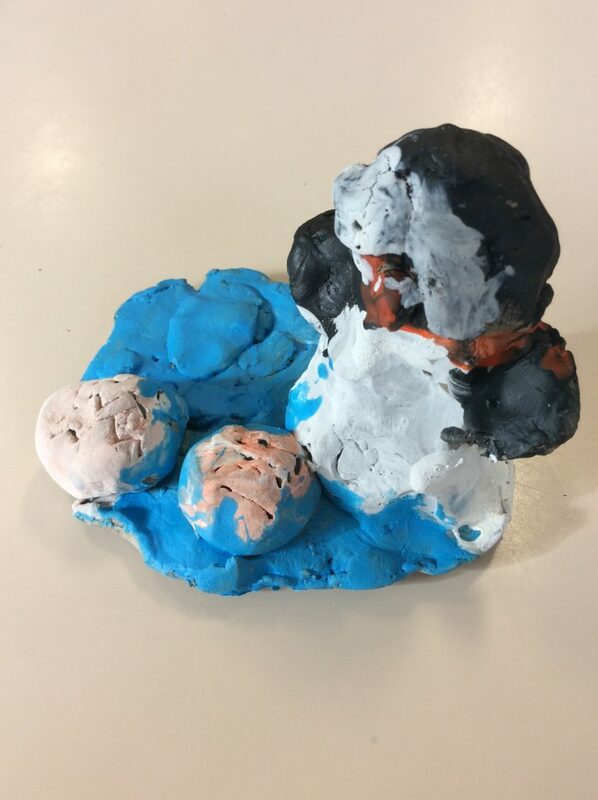 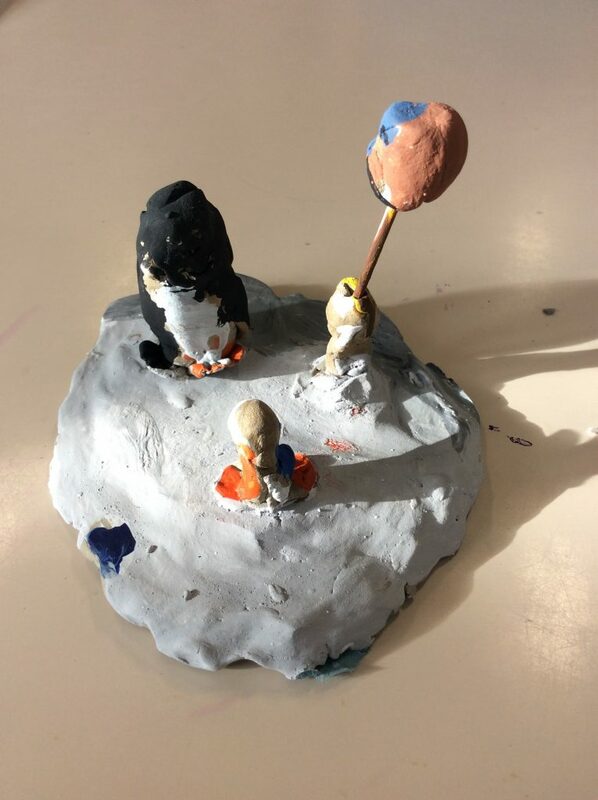 Do you like our finished clay penguins? 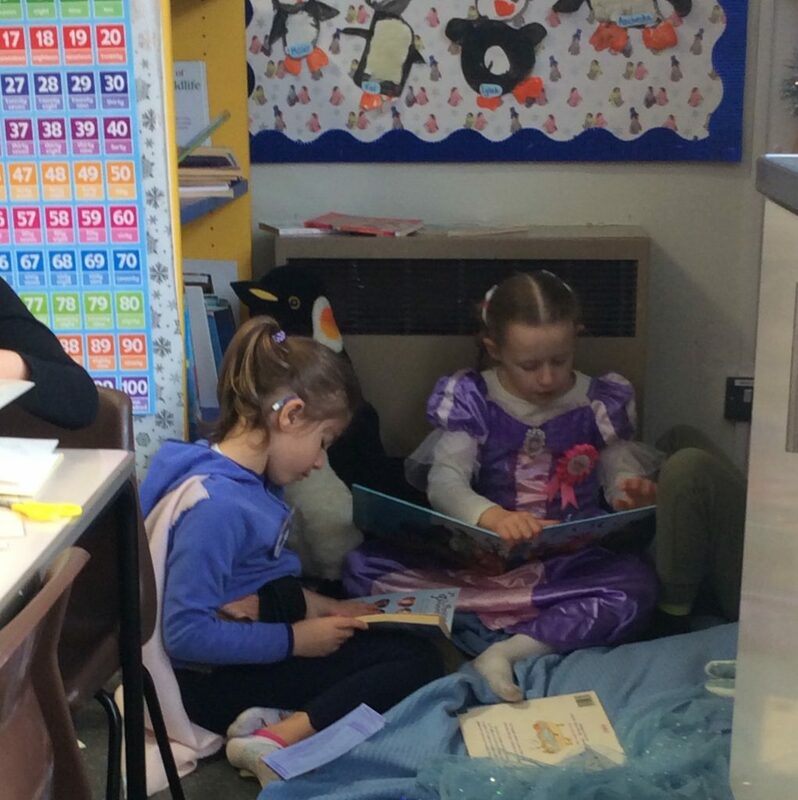 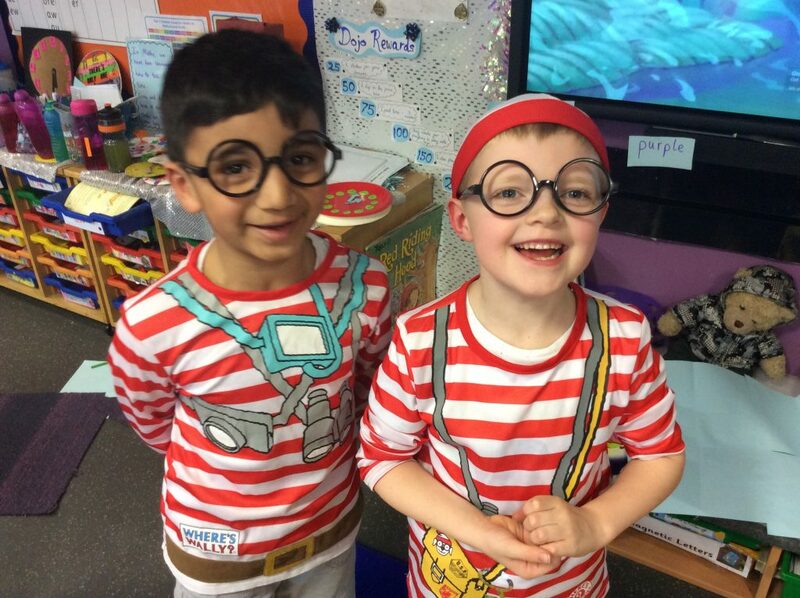 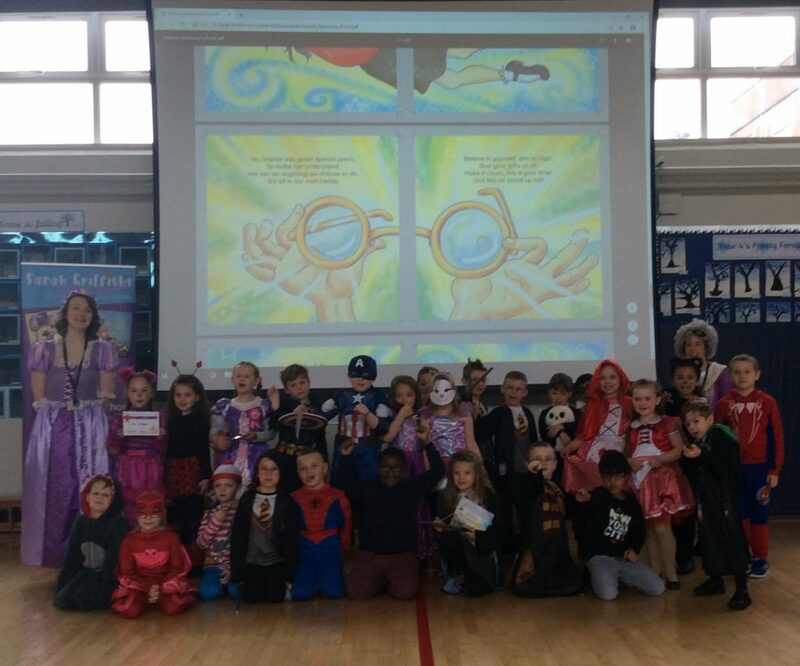 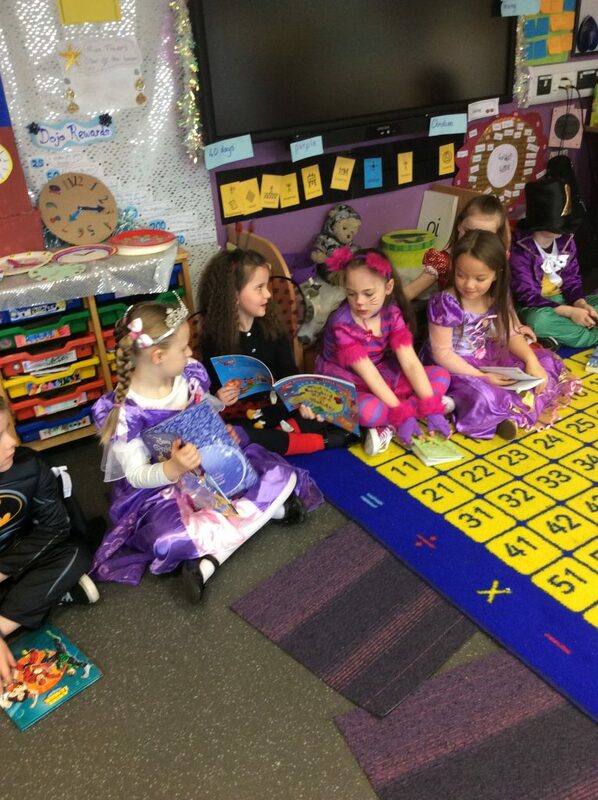 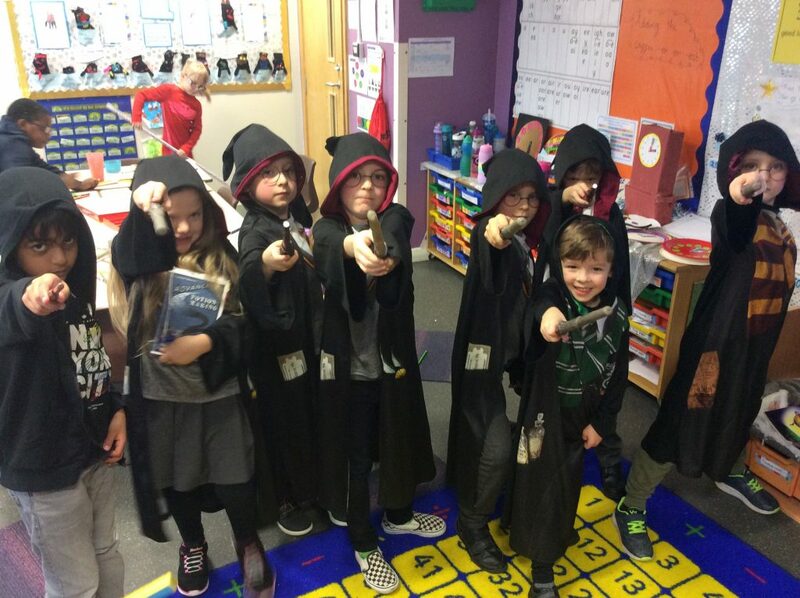 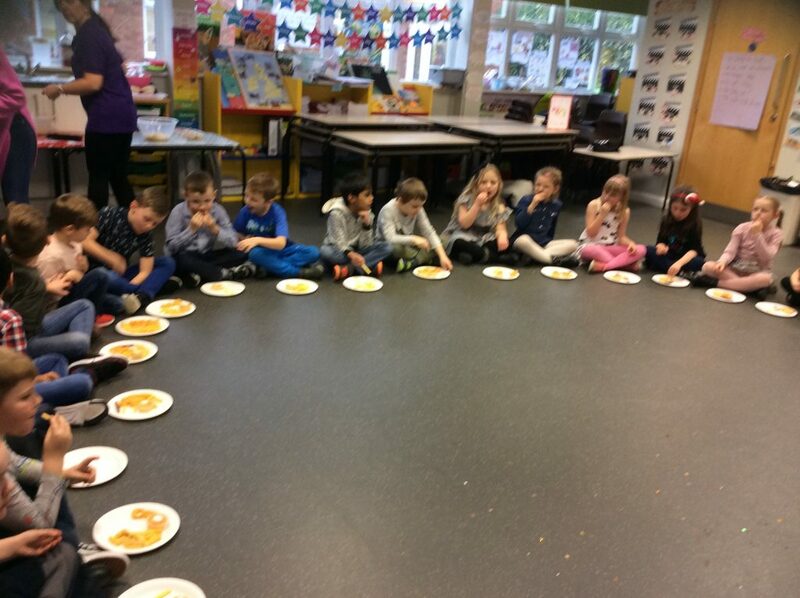 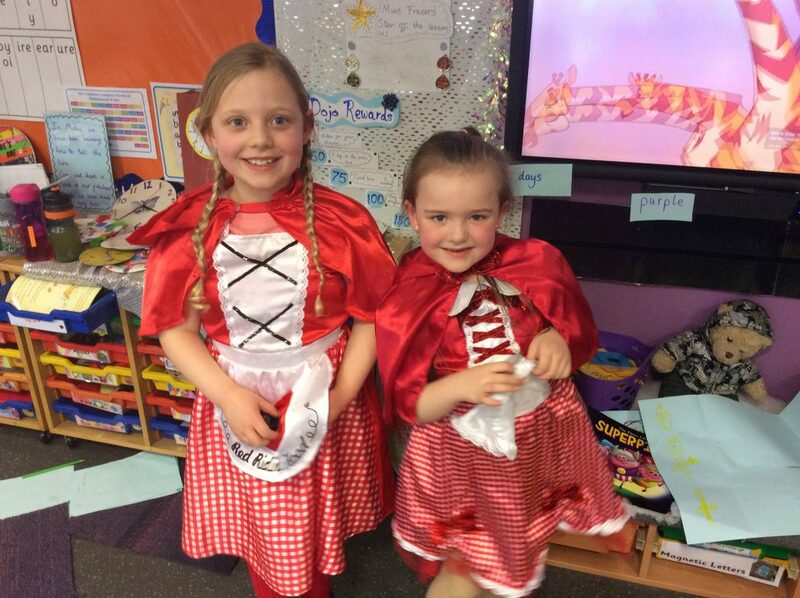 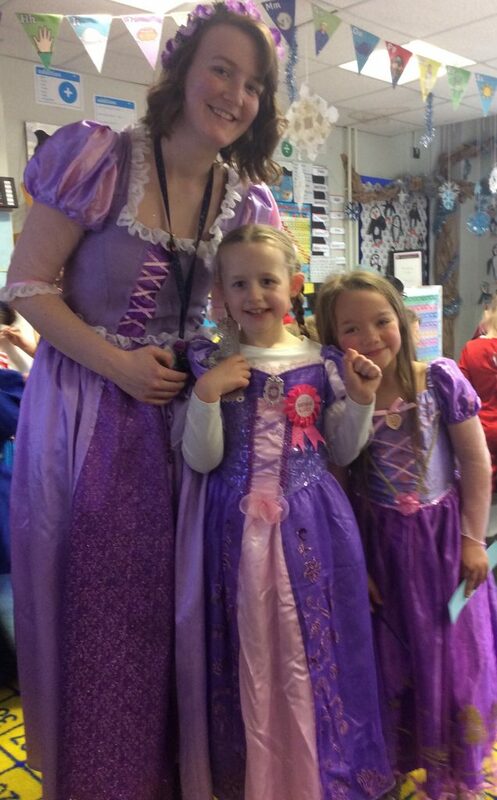 On Friday, we celebrated World Book Day! 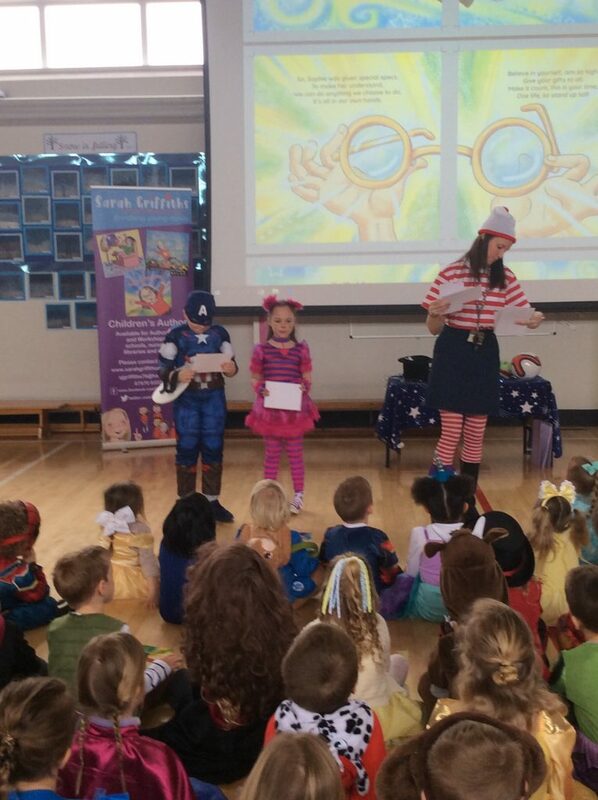 We had a special assembly from an author who read us one of her stories! 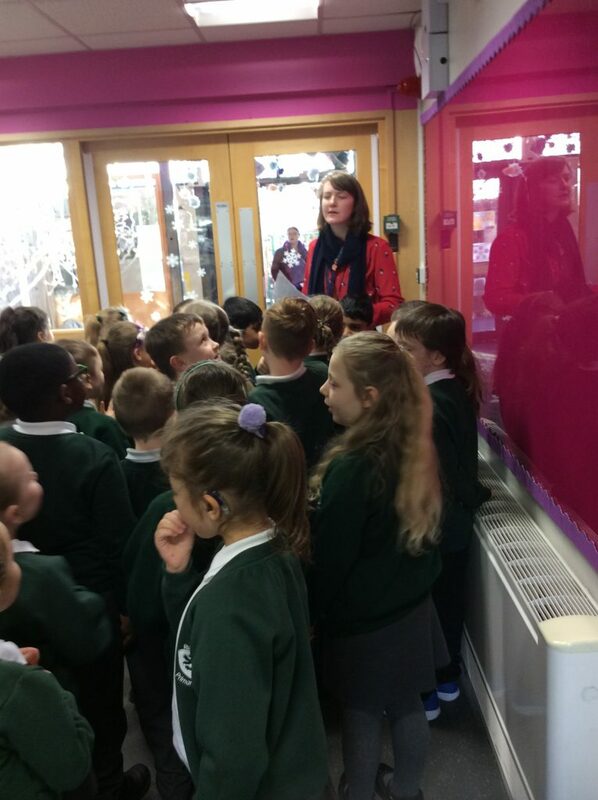 She taught as all about how she became an author and maybe how we could do the same one day! 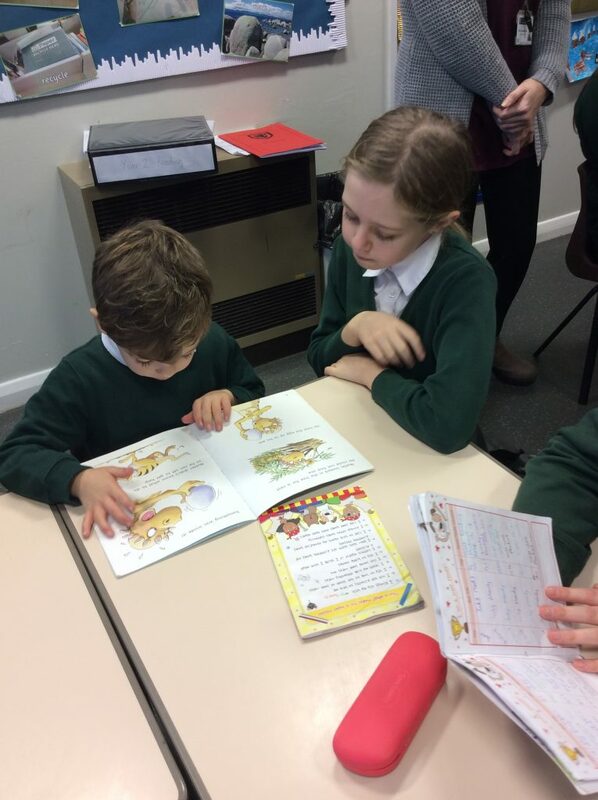 We have learnt all about everybody’s favourite stories and books. 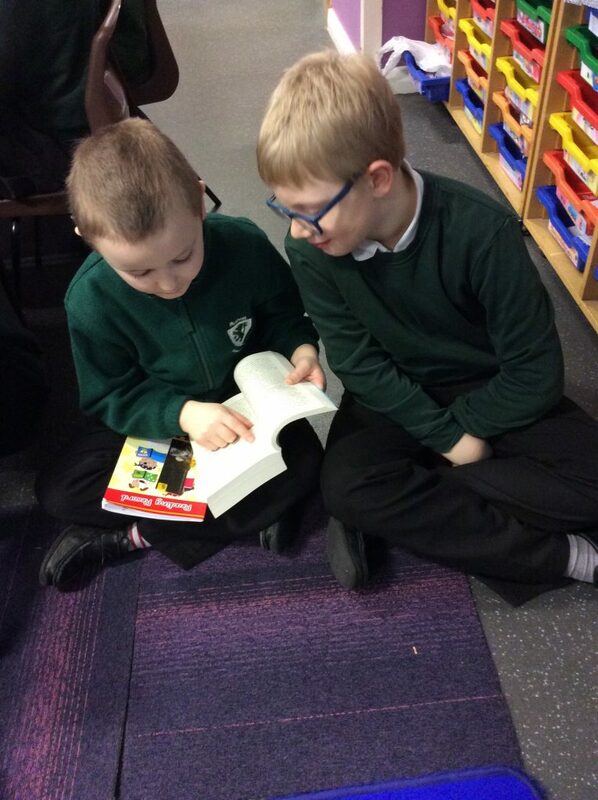 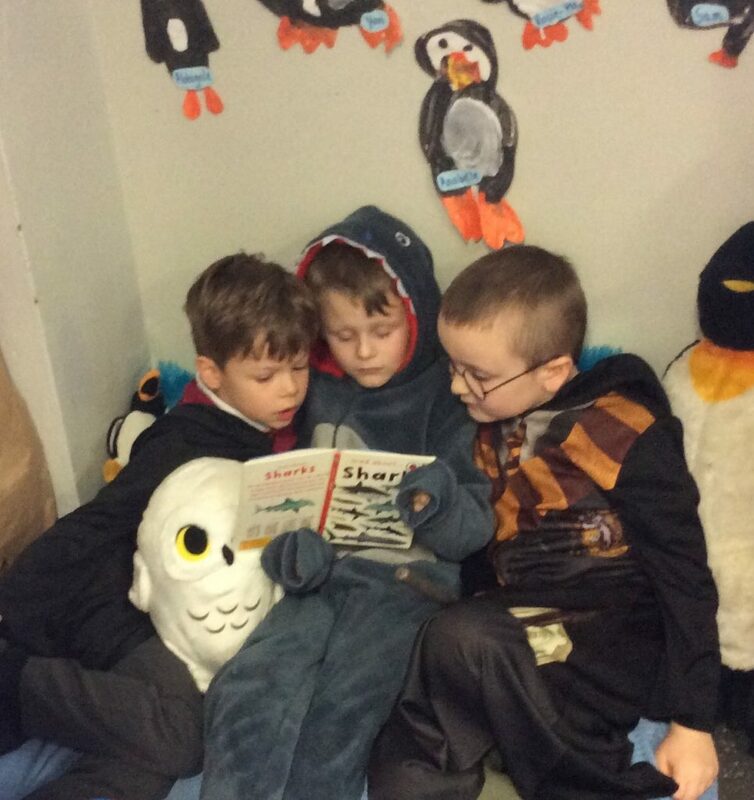 We enjoyed sharing a wide range of books with our friends- everything from fiction books such as ‘Harry Potter’ to non-fiction books such as ‘Mad about Sharks’. 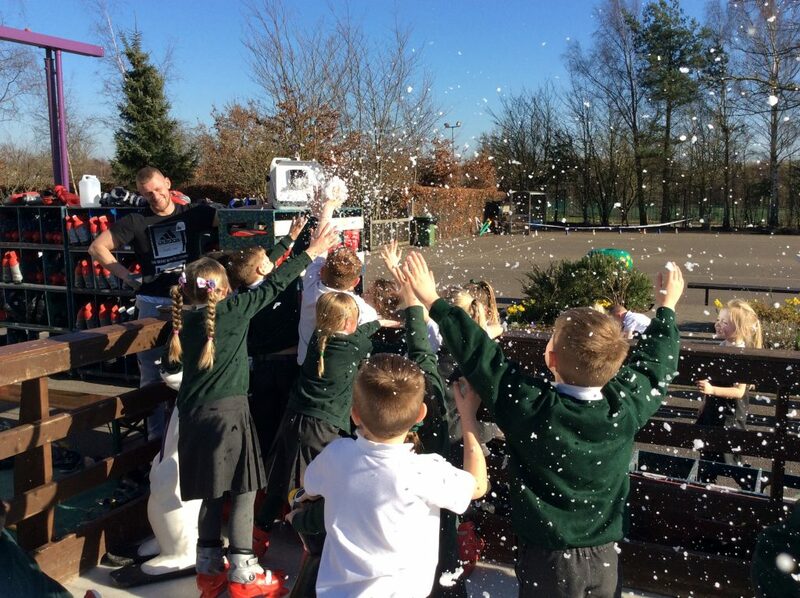 Skating in a winter wonderland! 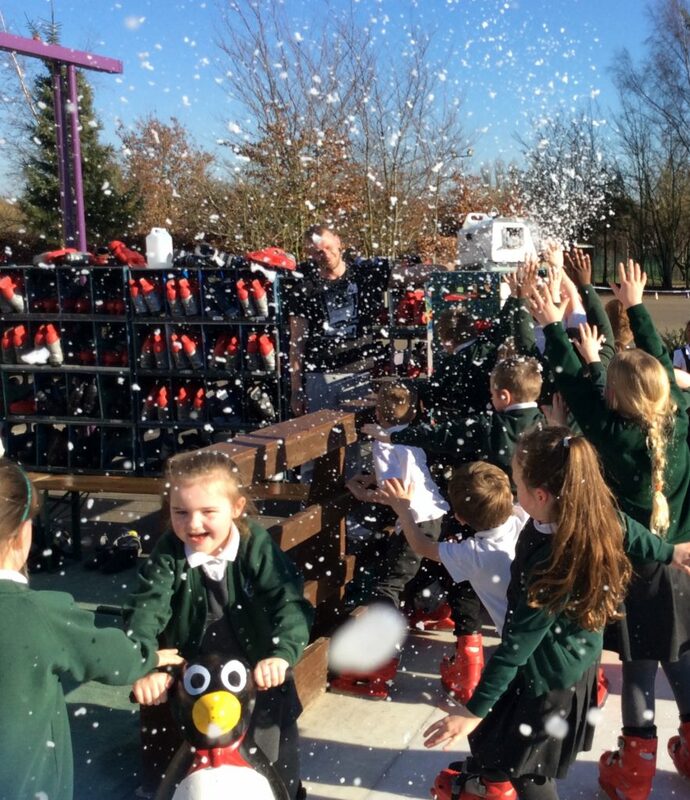 During our first week back at school after half term, something extremely exciting happened on our playground! 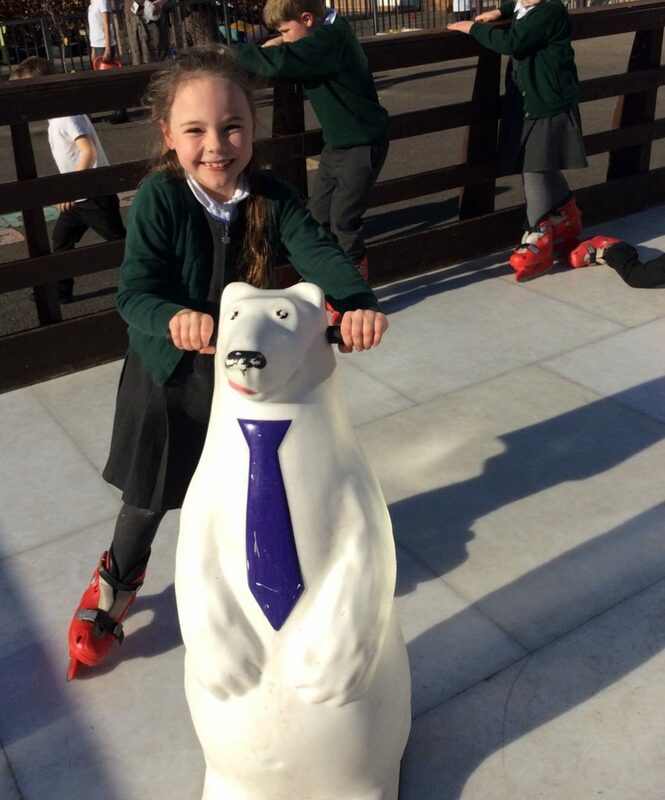 We arrived at school on Tuesday to find an ice rink in the middle of where we usually run around and play! 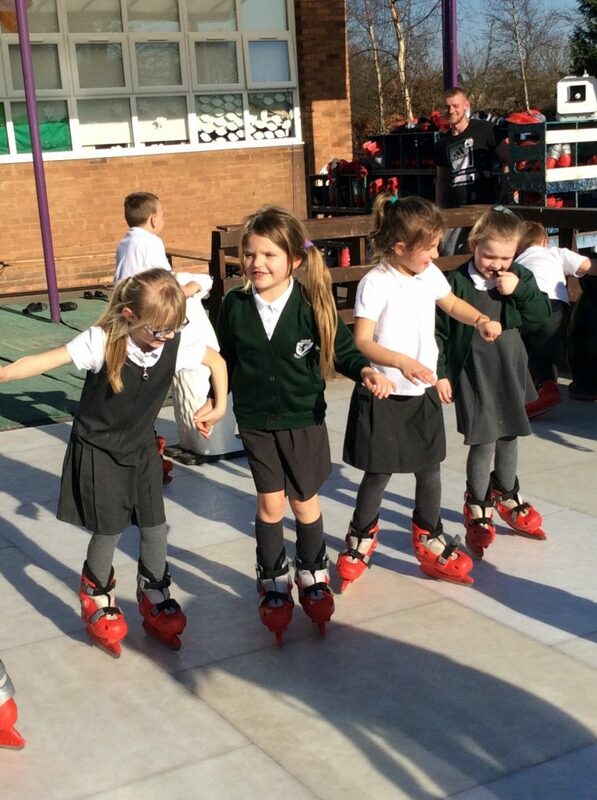 We had a magical time skating in the sunshine. 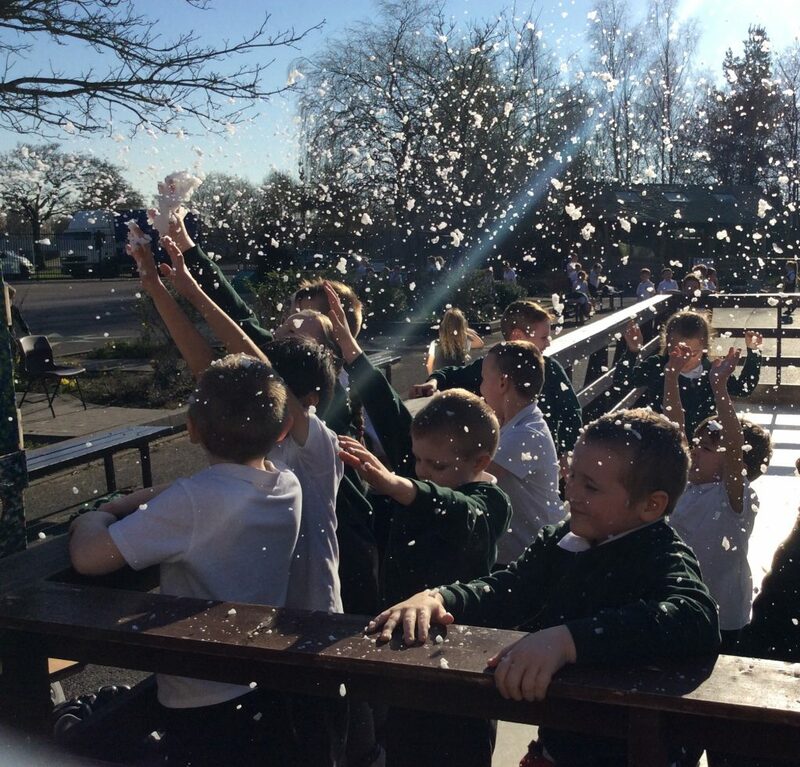 Can you believe we even had some snow in the 20°C February heat? 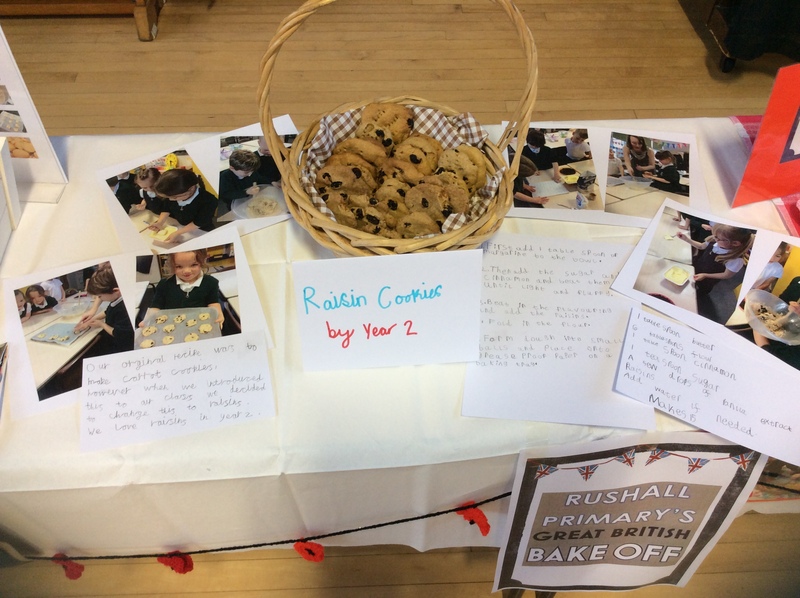 We are so lucky to go to Rushall School! 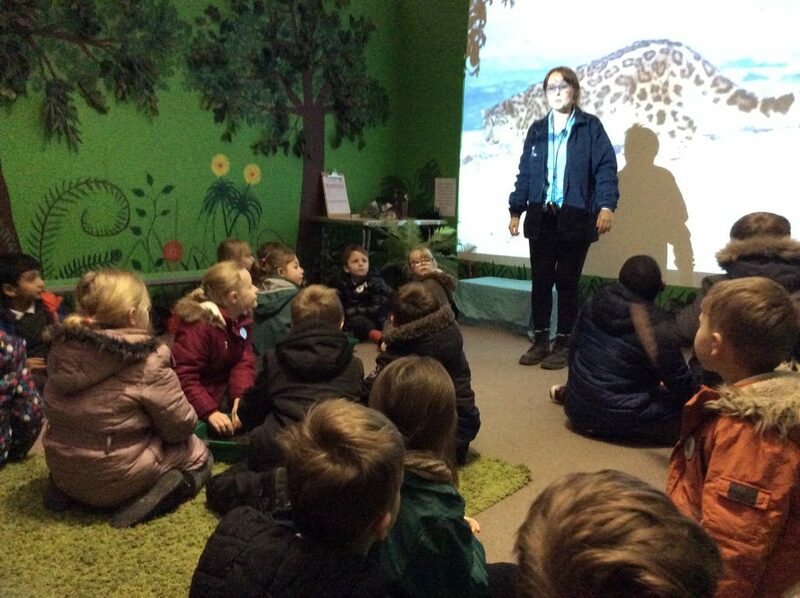 On Tuesday 5th February, we went to the zoo! 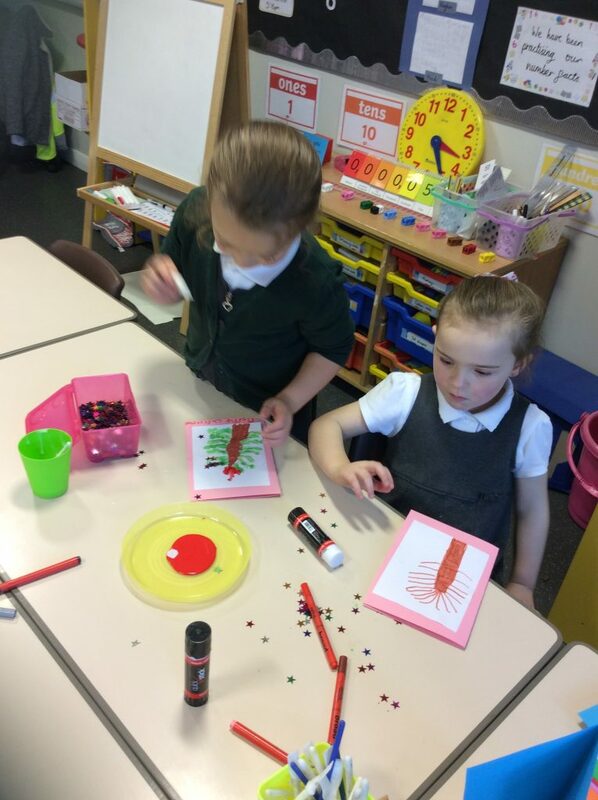 We had a really great time learning about lots of different animals! 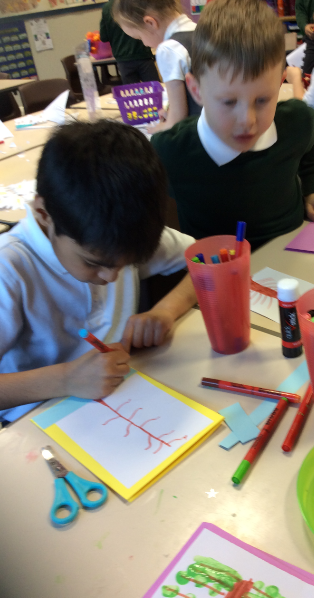 We learnt all about animals habitats! 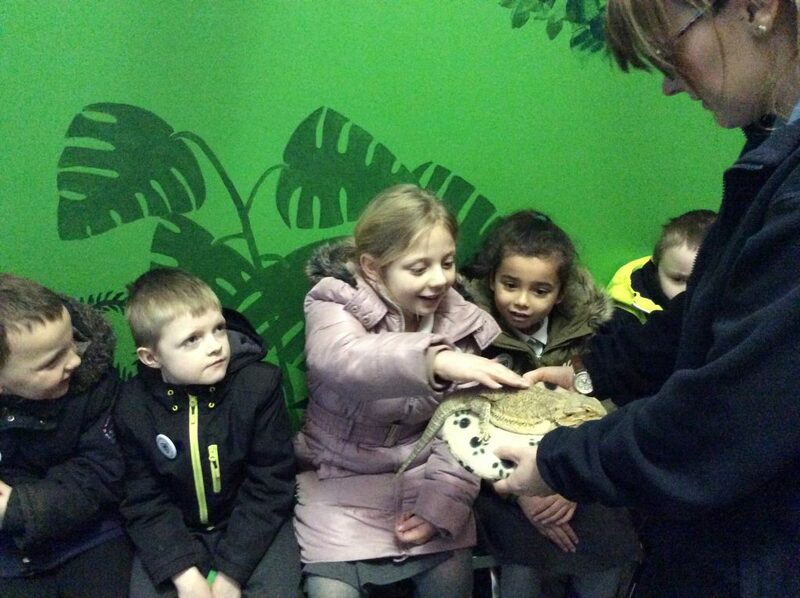 We met a bearded dragon. 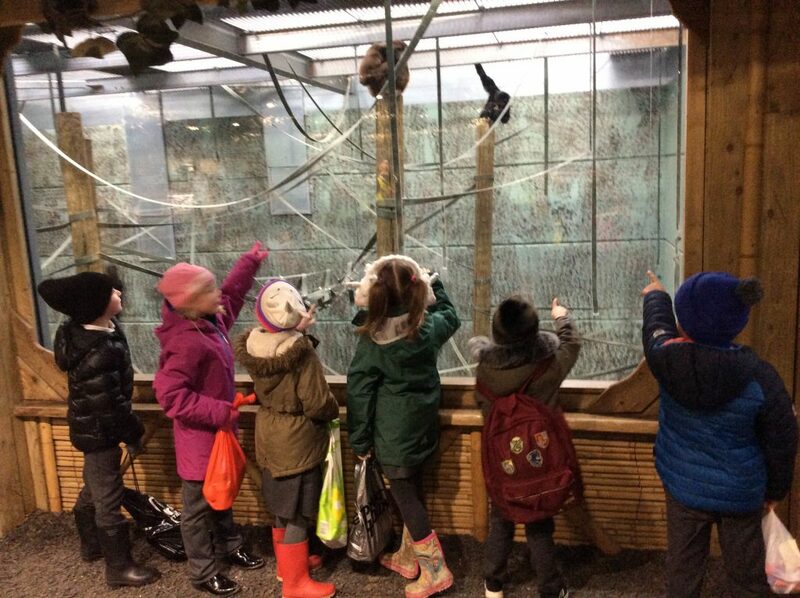 We saw some gibbons and siamang. 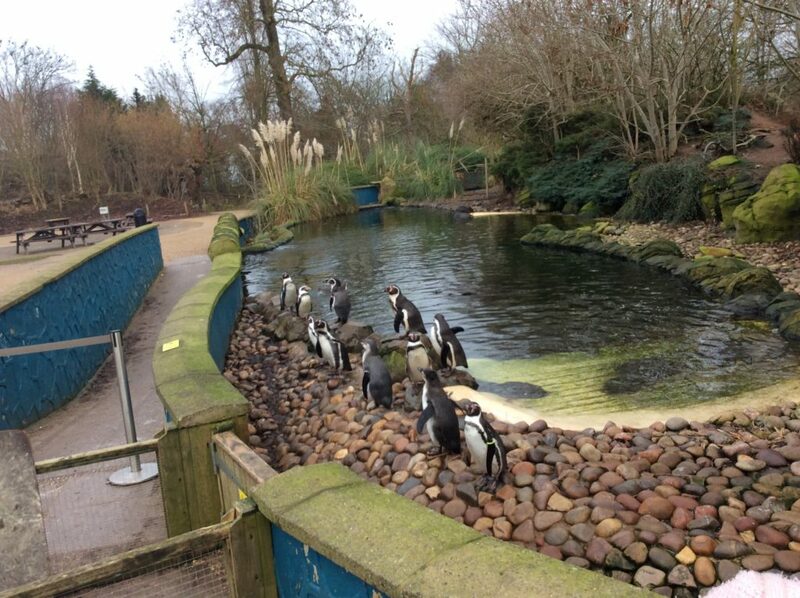 We even saw the penguins being fed! 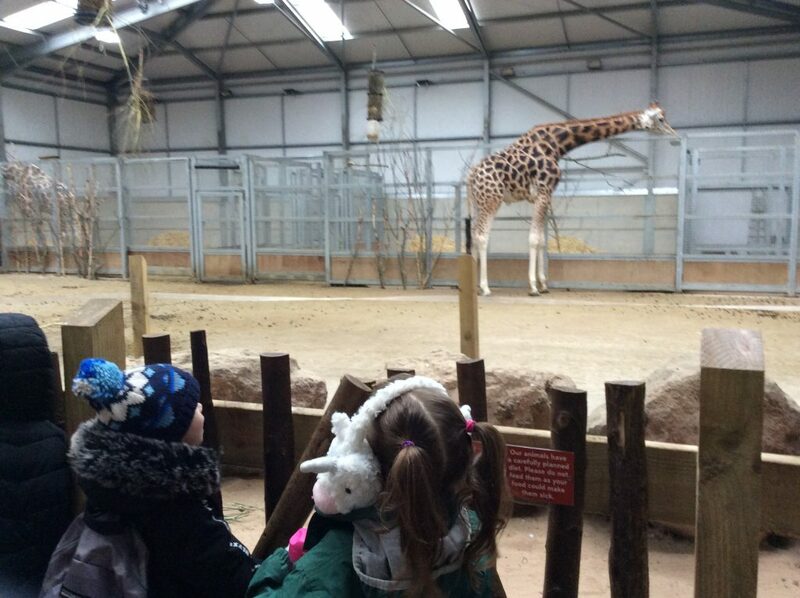 We saw some very tall giraffes! 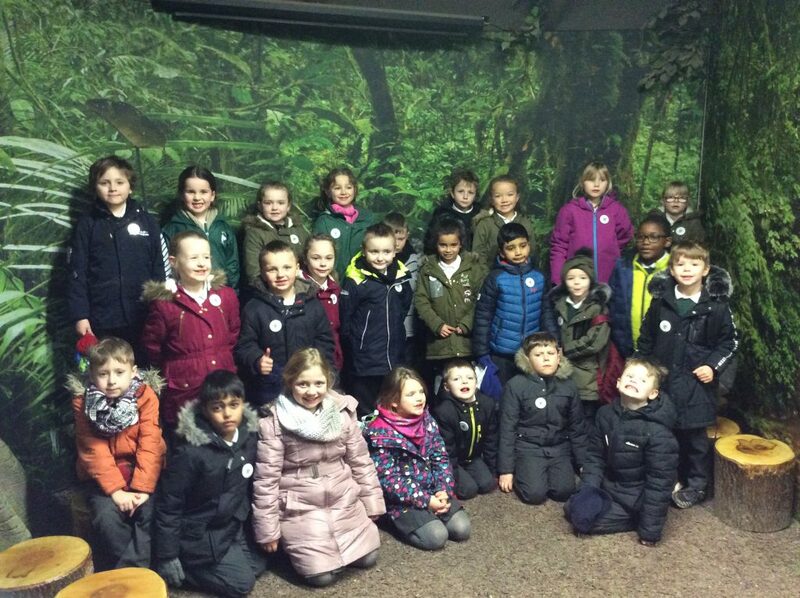 We loved going to the zoo with our friends, it was very special to see lots of amazing animals! 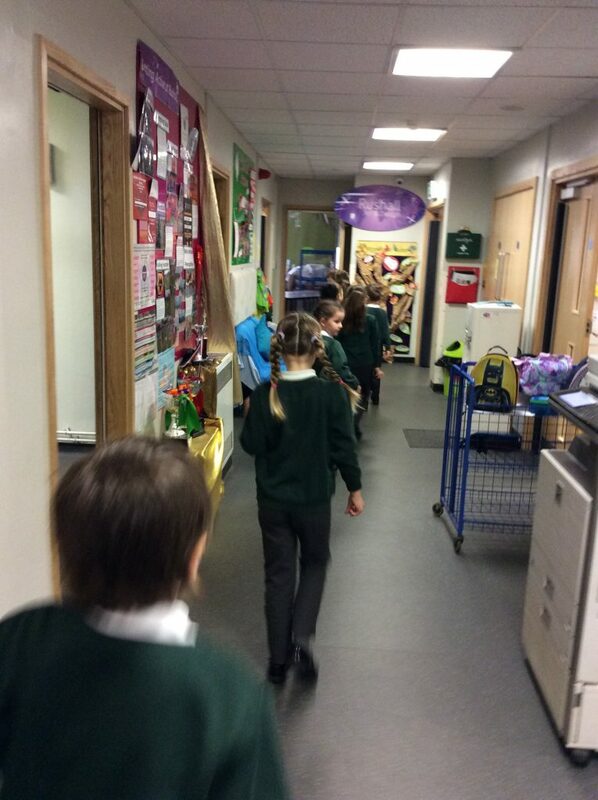 We especially enjoyed watching the penguins waddle across the walkway to get their food. 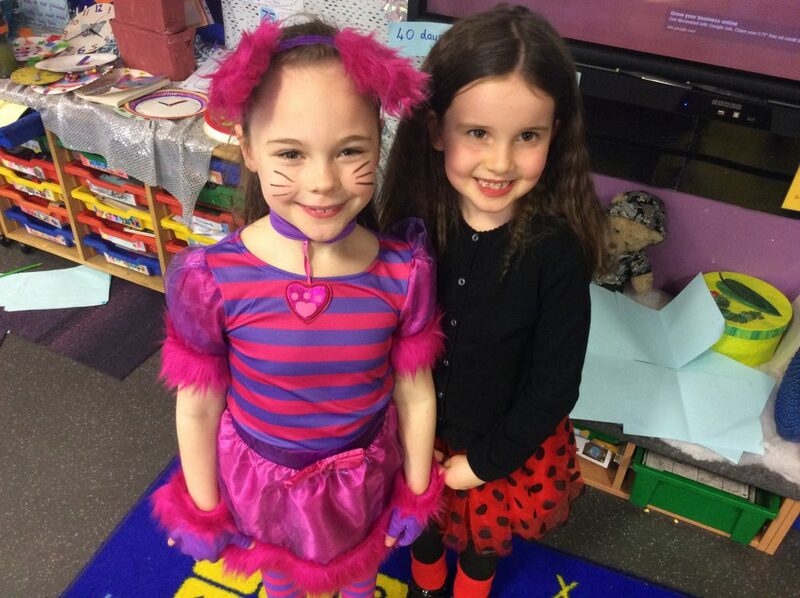 We have lots of favourite animals, but what is yours? 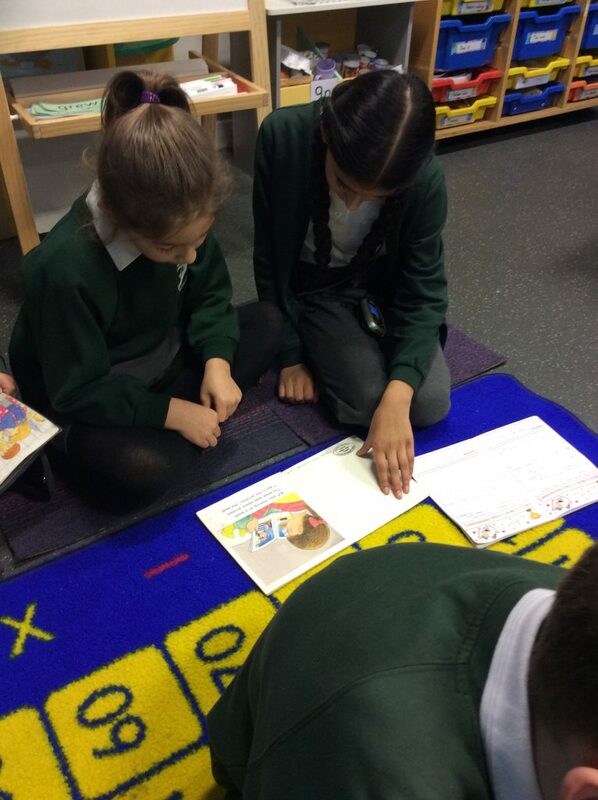 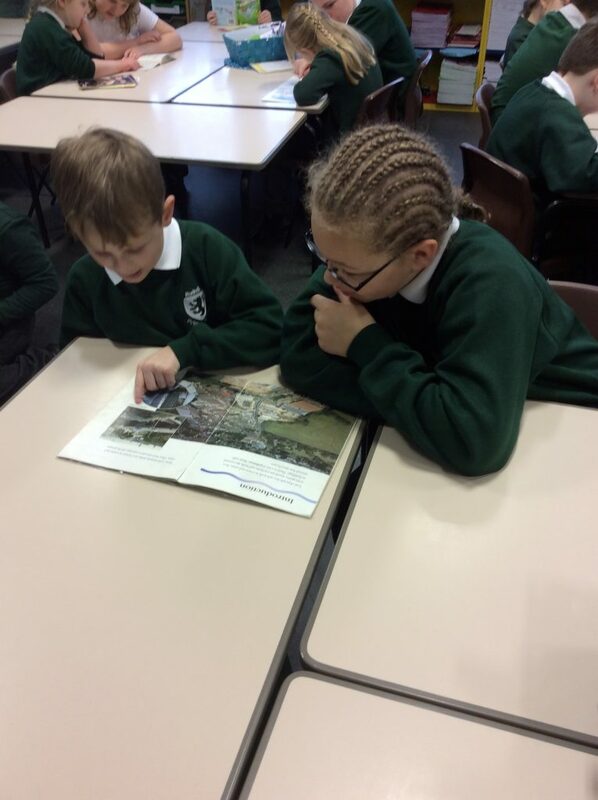 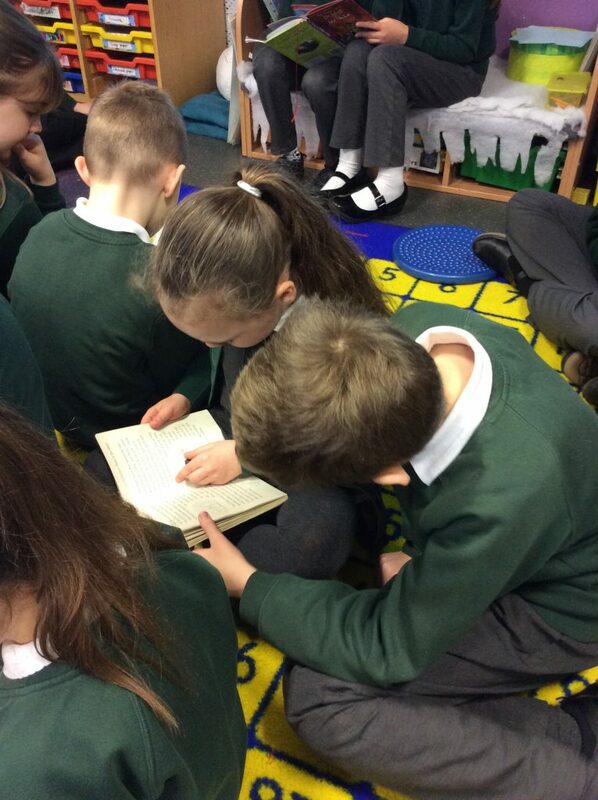 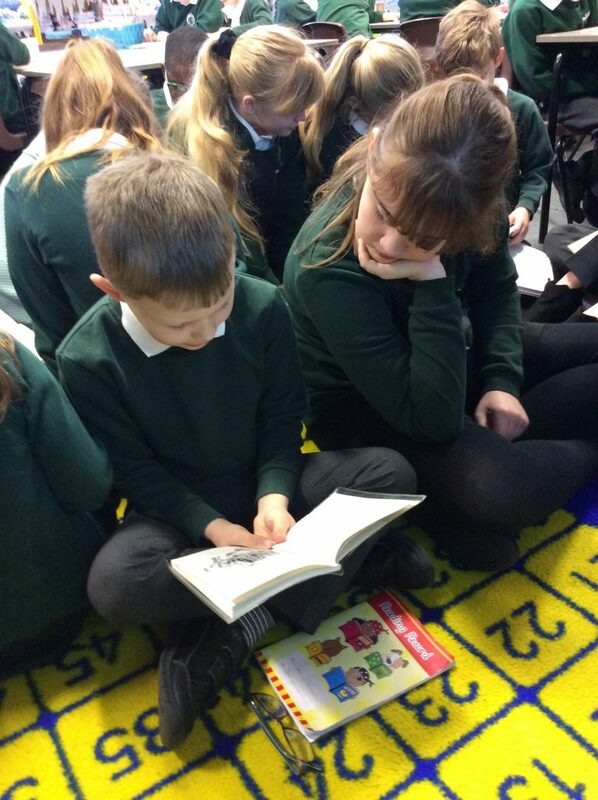 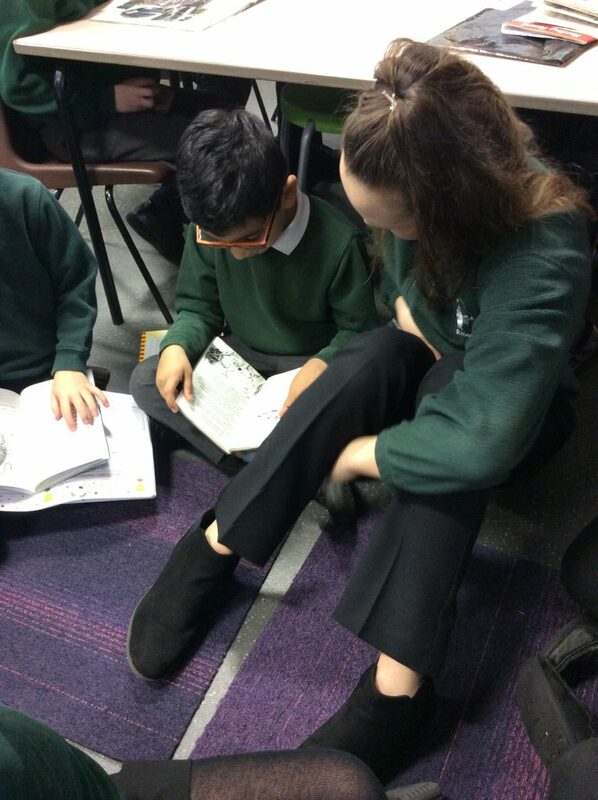 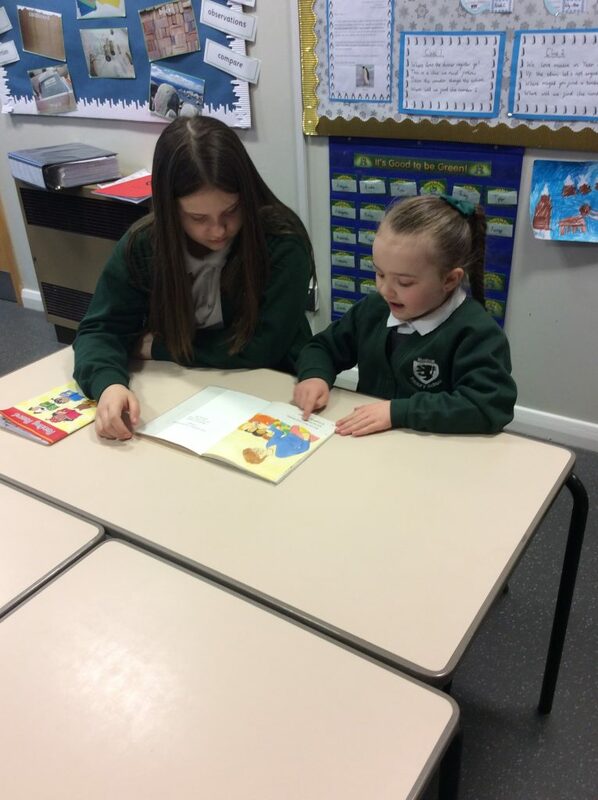 On Monday, we joined up with Year 6 to enjoy some paired reading. 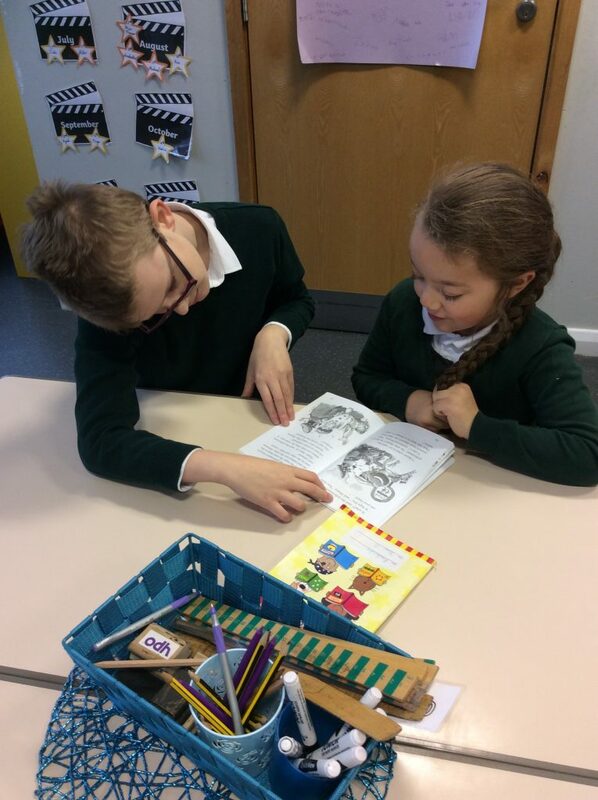 We loved reading our stories to our partners. 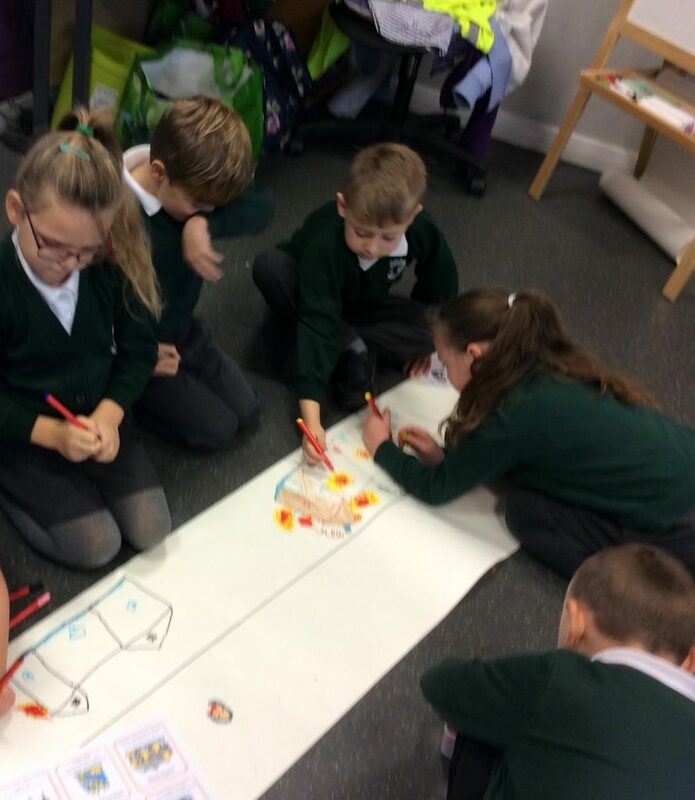 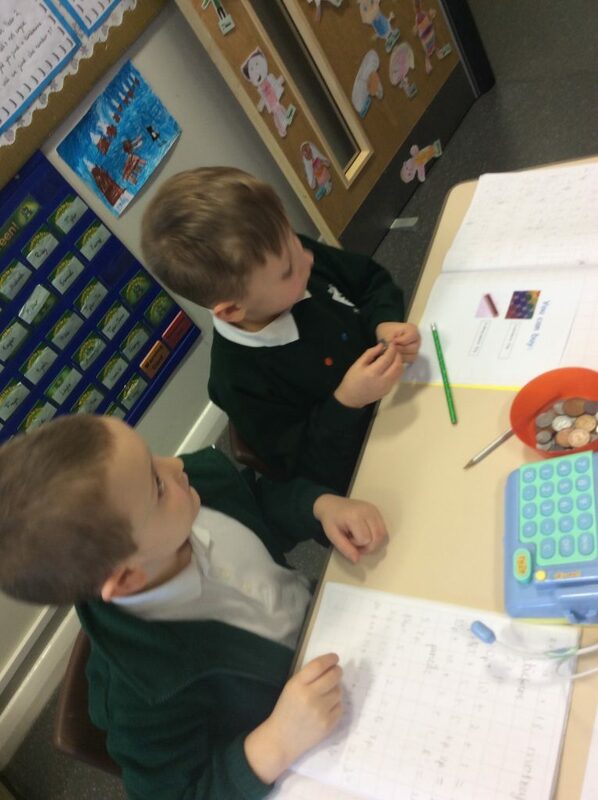 In Year 2, we are learning all about money. 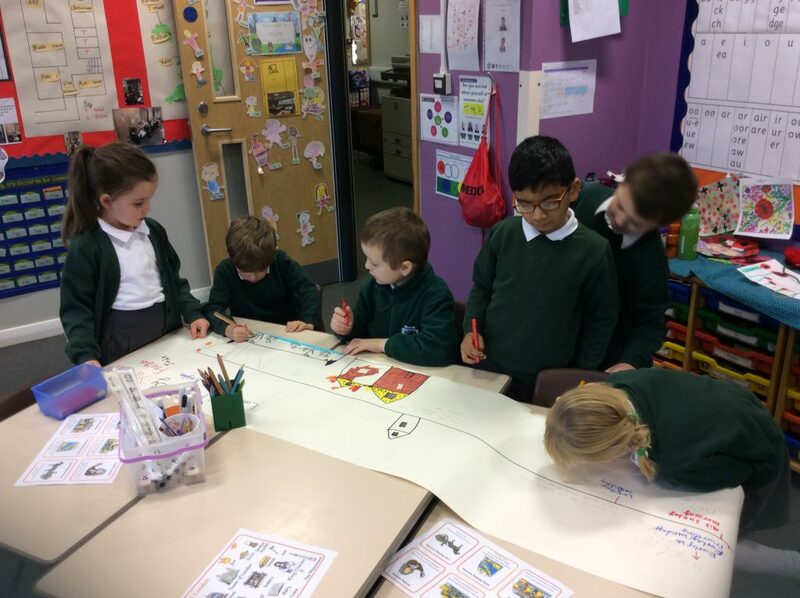 Today each table in Year 2 turned into a shop! 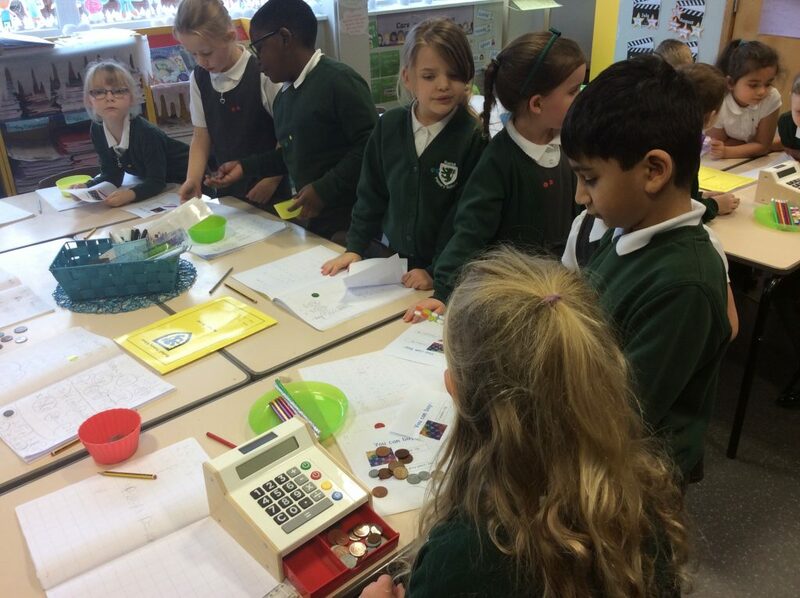 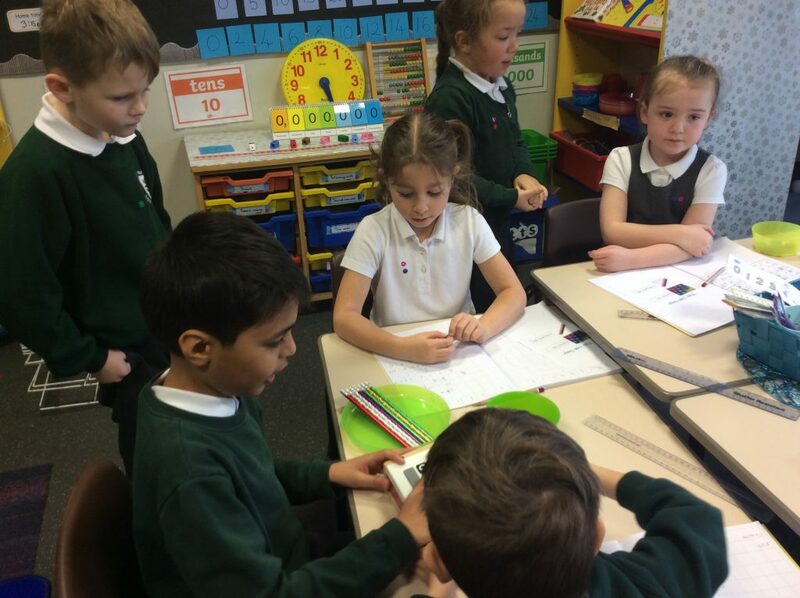 We had to find lots of different ways to make certain amounts, before we could then buy the items we wanted to. 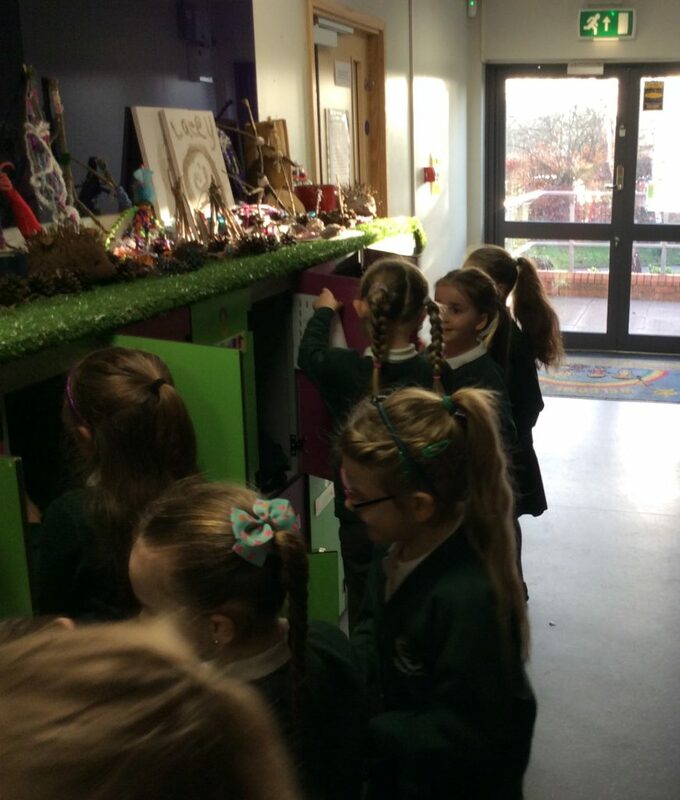 Our shopkeepers did a super job, checking everyone had given the correct amount and giving any change back if needed. 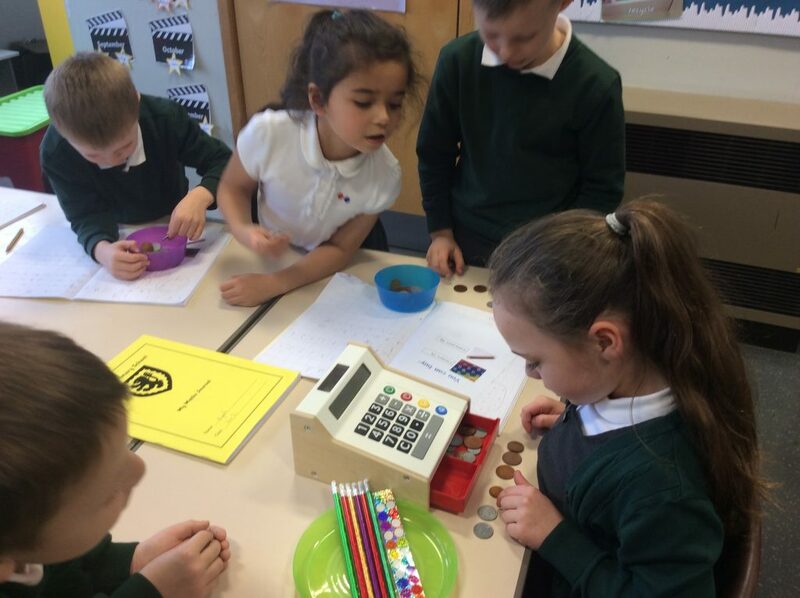 We all feel confident, counting different amounts of money, using coins. 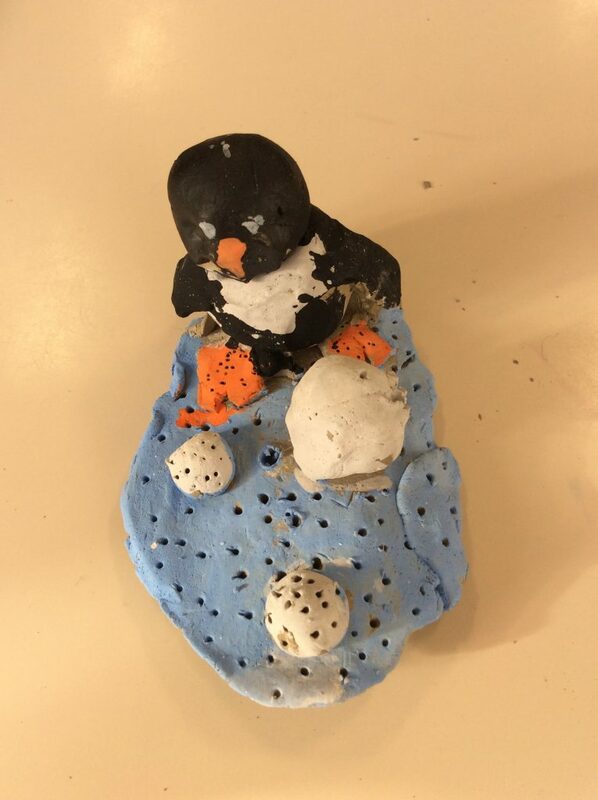 We found a penguin egg! 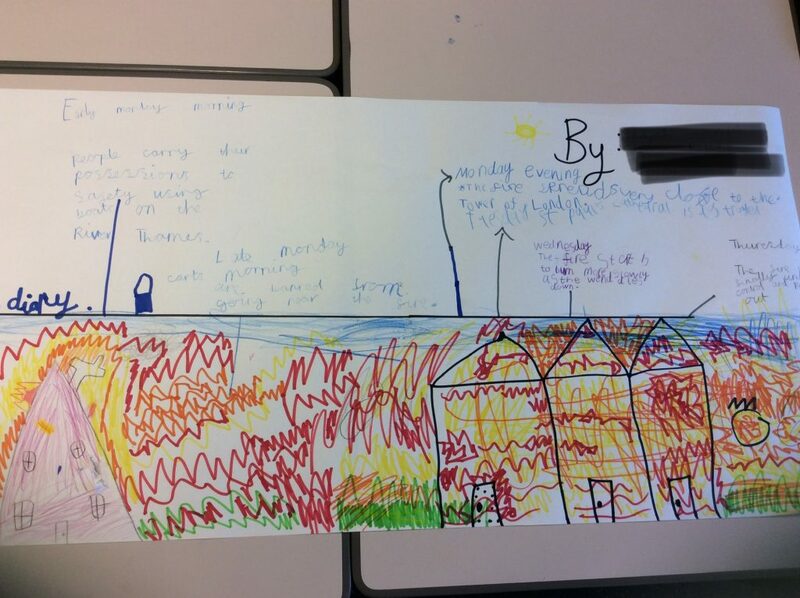 This morning, we received a very unexpected letter! 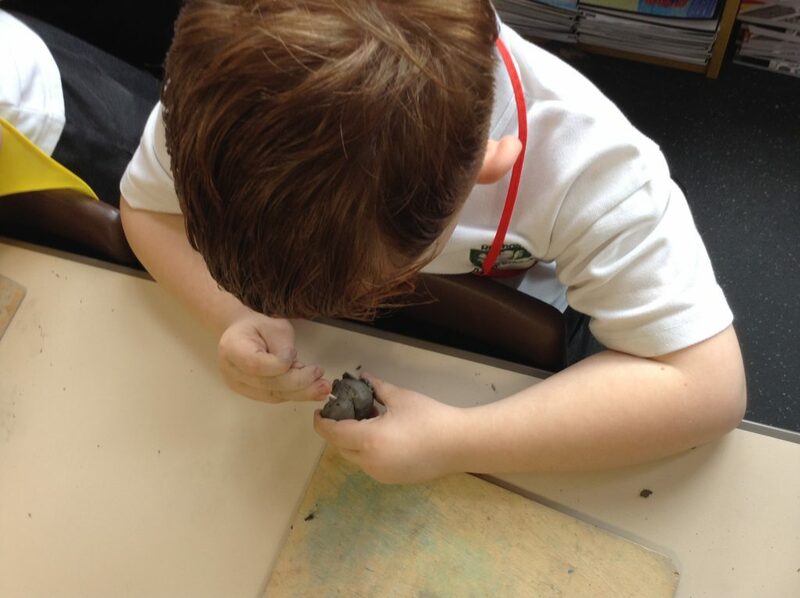 It led us on a hunt for clues to help us find something very special. 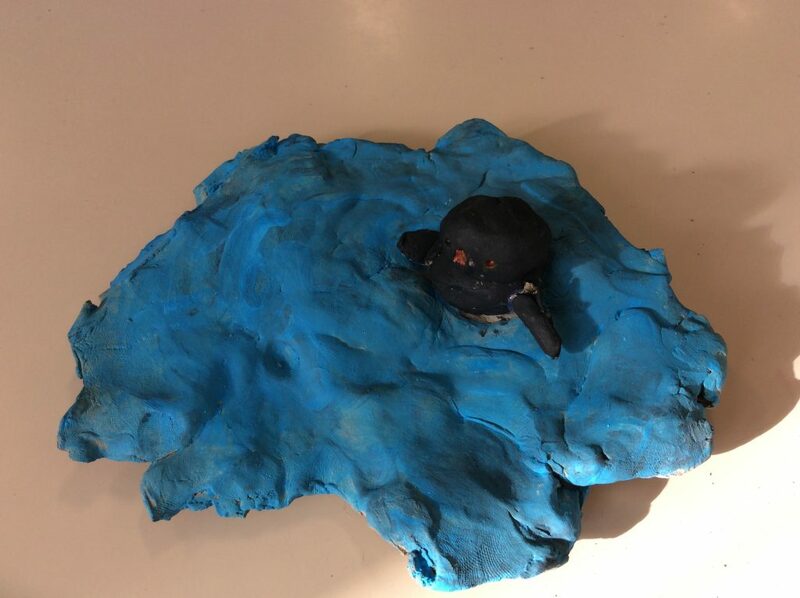 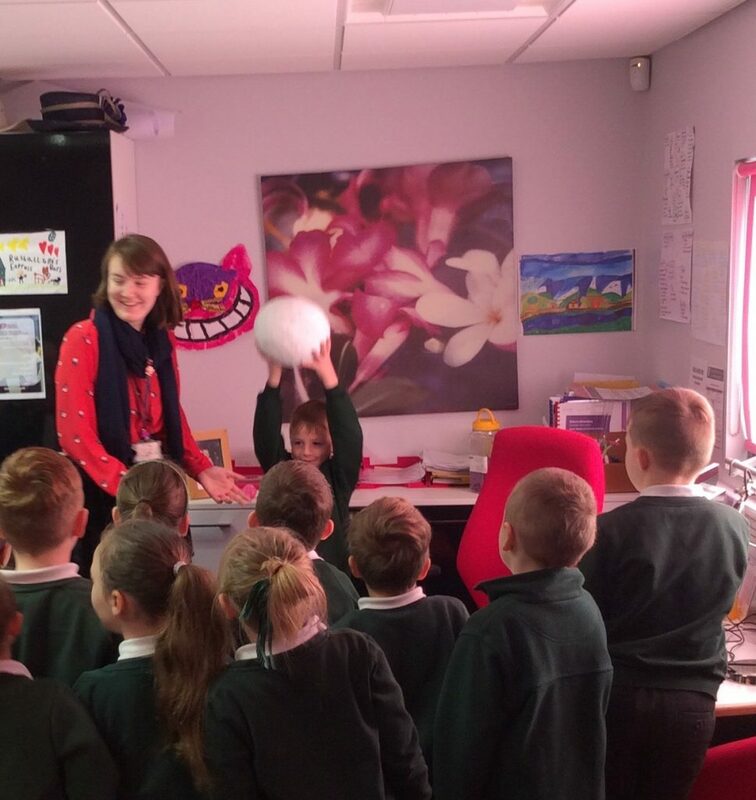 We searched high and low through the school and eventually found a penguin egg hiding in Mrs Bargh’s office, underneath her chair! 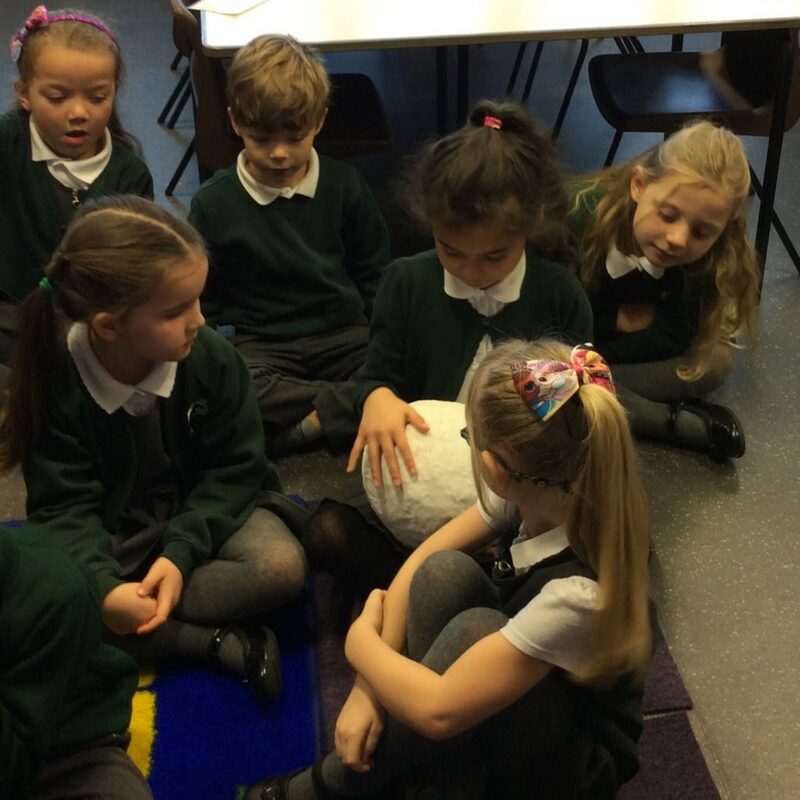 We were very excited and are going to keep the egg very safe until the Mummy penguin comes back for it. 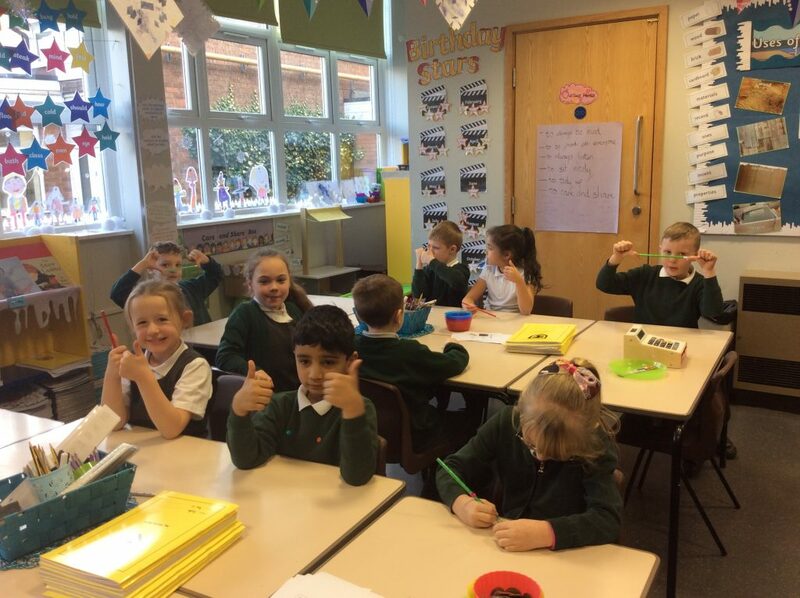 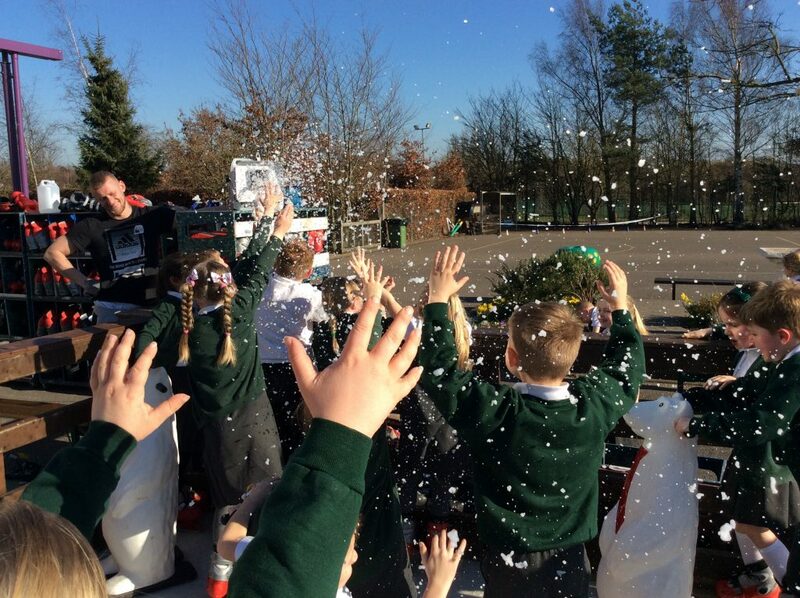 In Year 2, we have extremely enjoyed all the special things we have done in December. 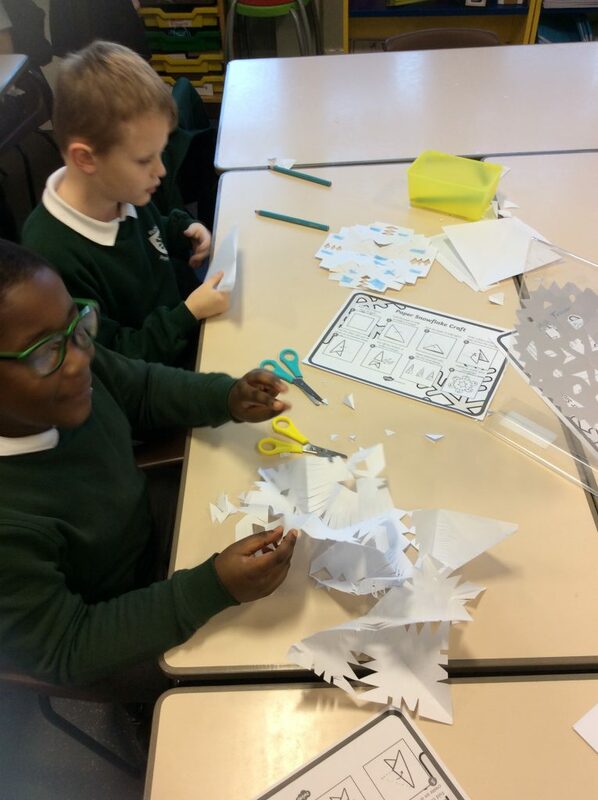 These include, making Christmas cards, making Festive cookies and making some snowflakes to decorate our classroom. 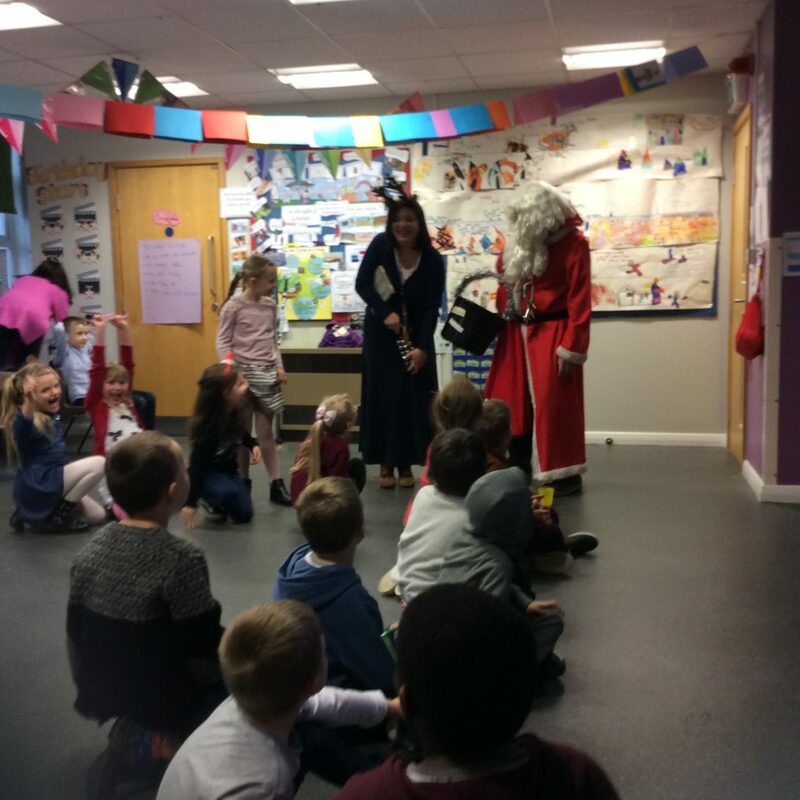 During our Christmas party, we heard some magical bells ringing outside our classroom, it was Santa! 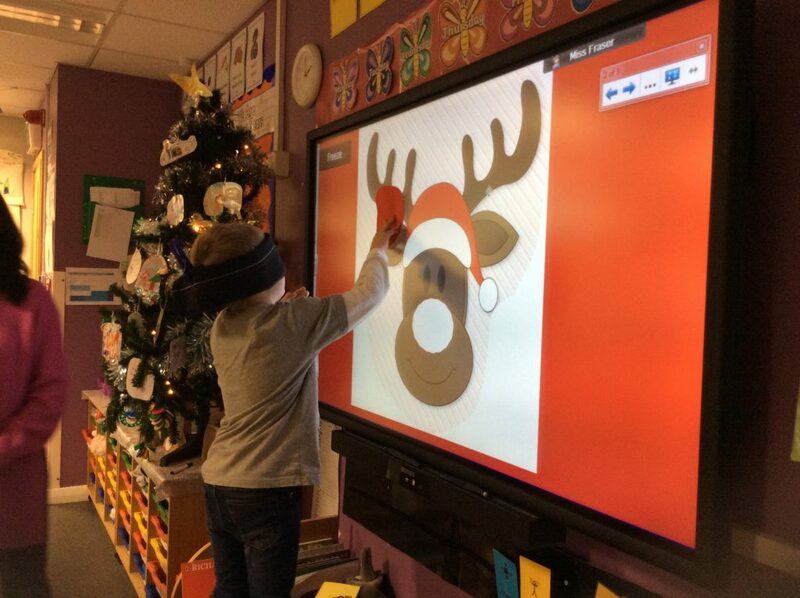 He spent some time with us and told us all about his reindeers and Mrs Claus. 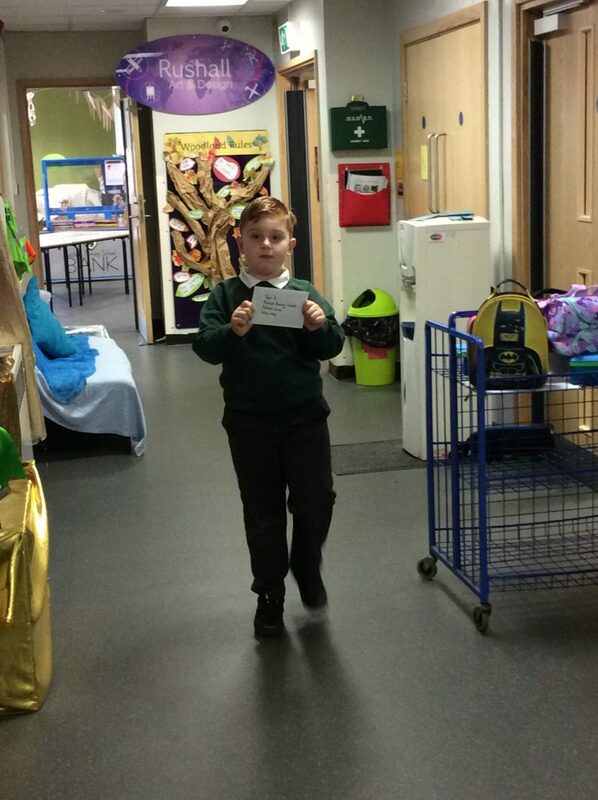 He even gave us all a present! 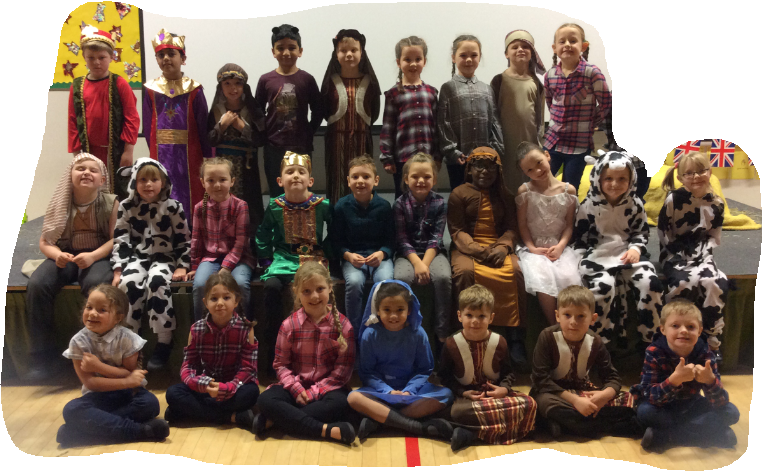 We all took part in our KS1 Christmas play, Prickly Hay. 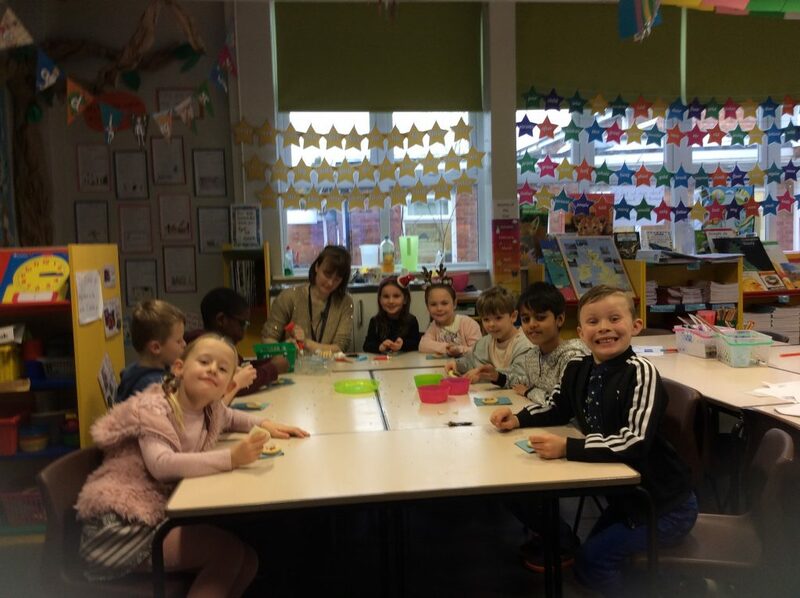 Miss Fraser is so proud of every one of us in Year 2 and it was a fabulous end to 2018. 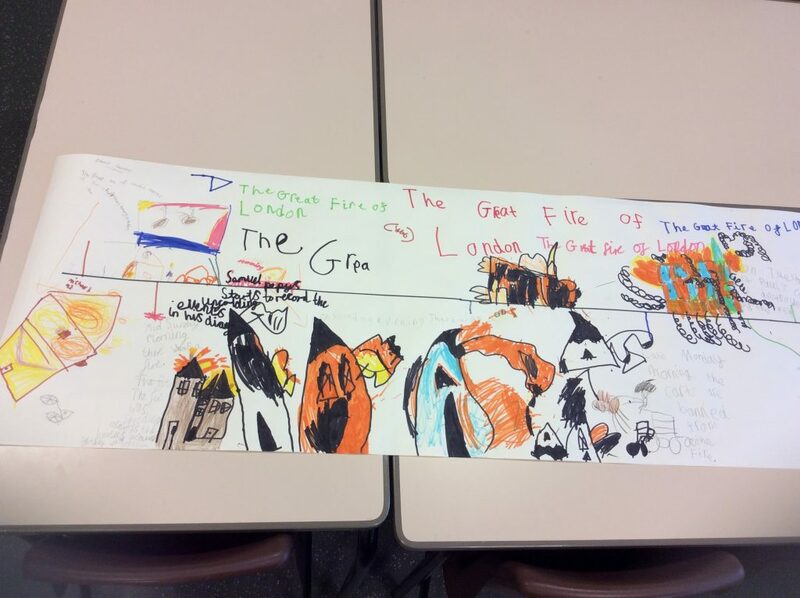 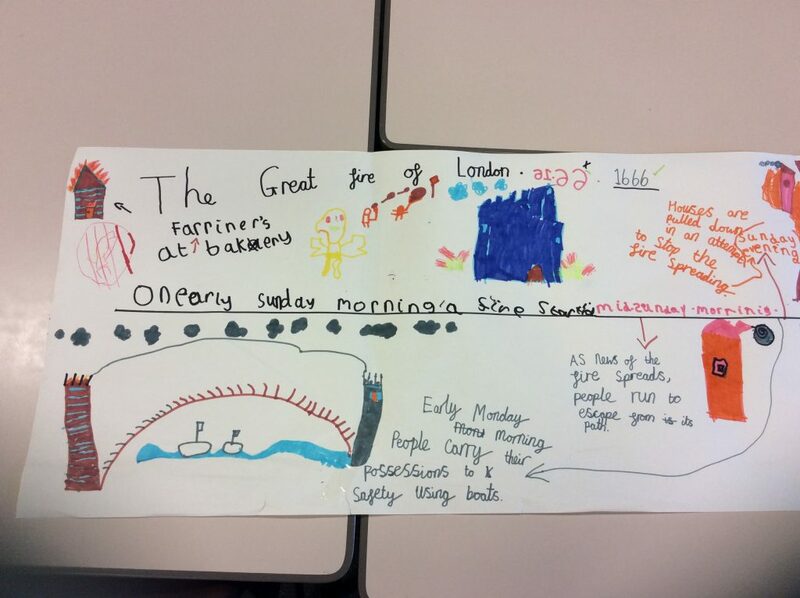 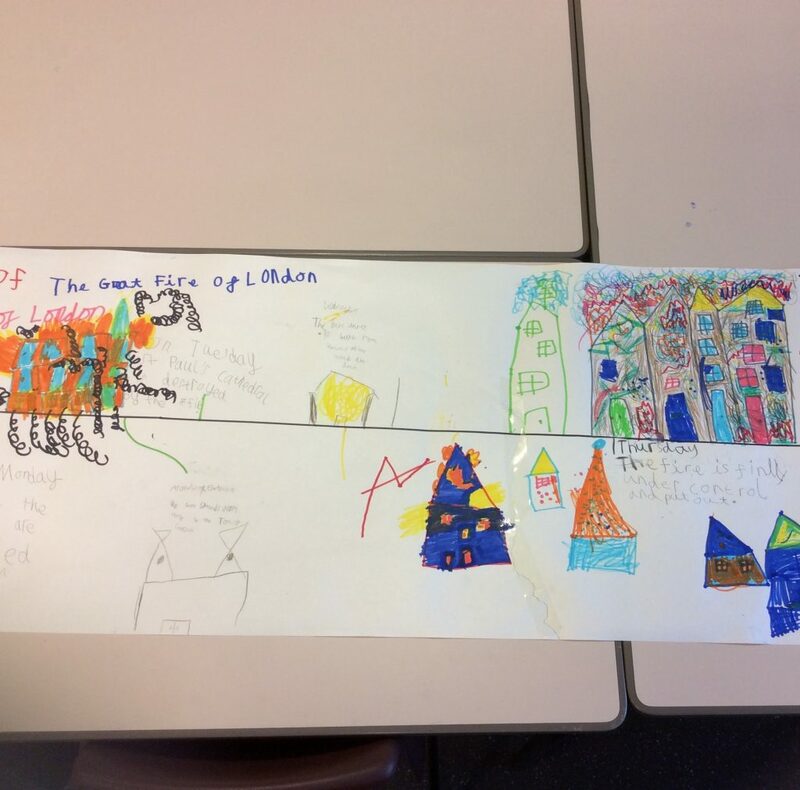 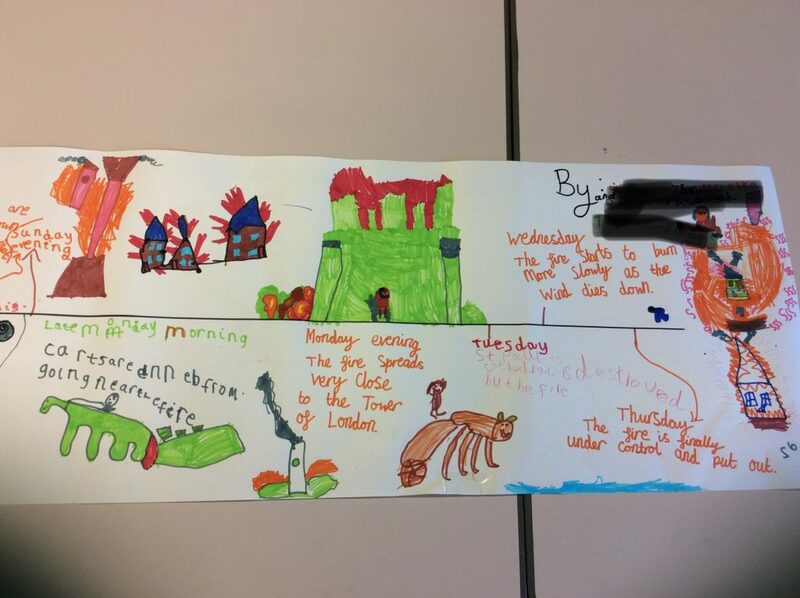 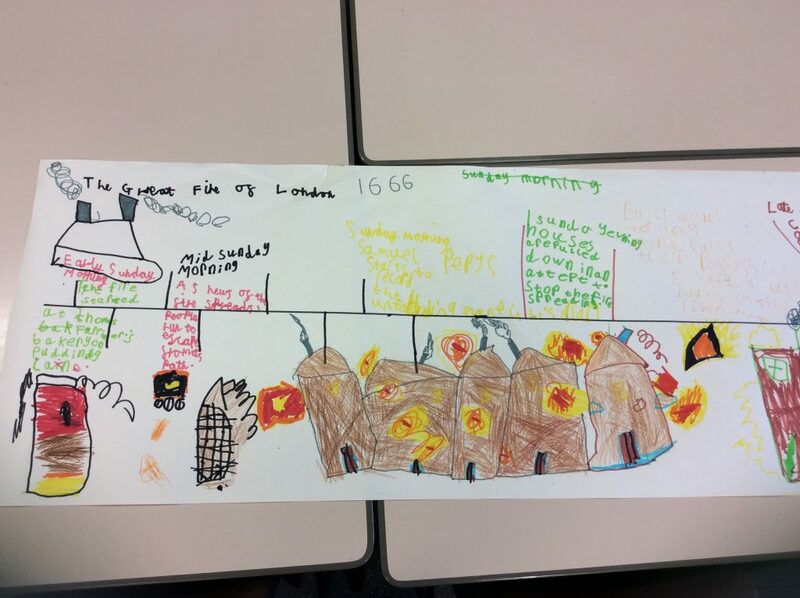 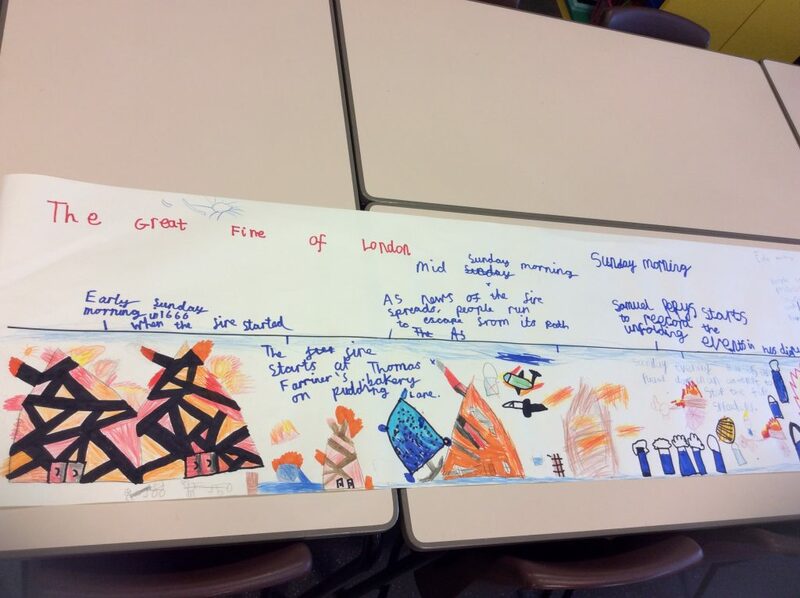 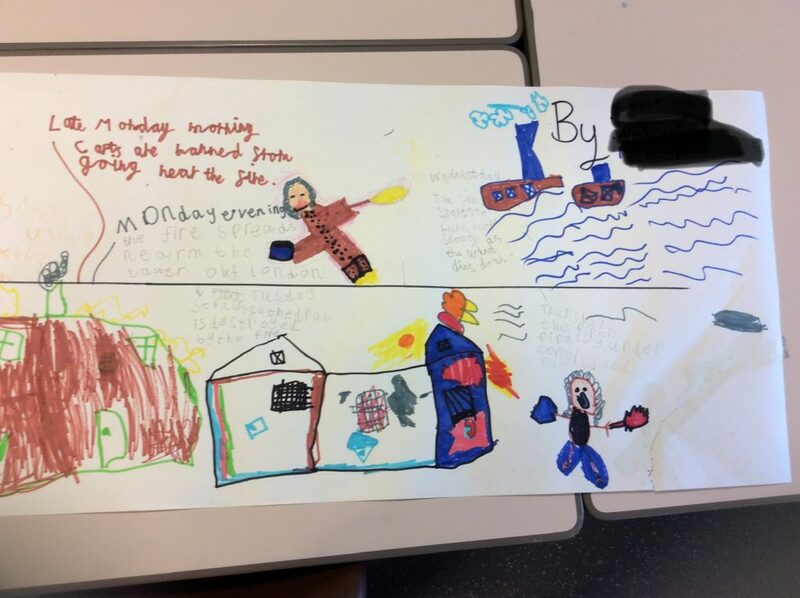 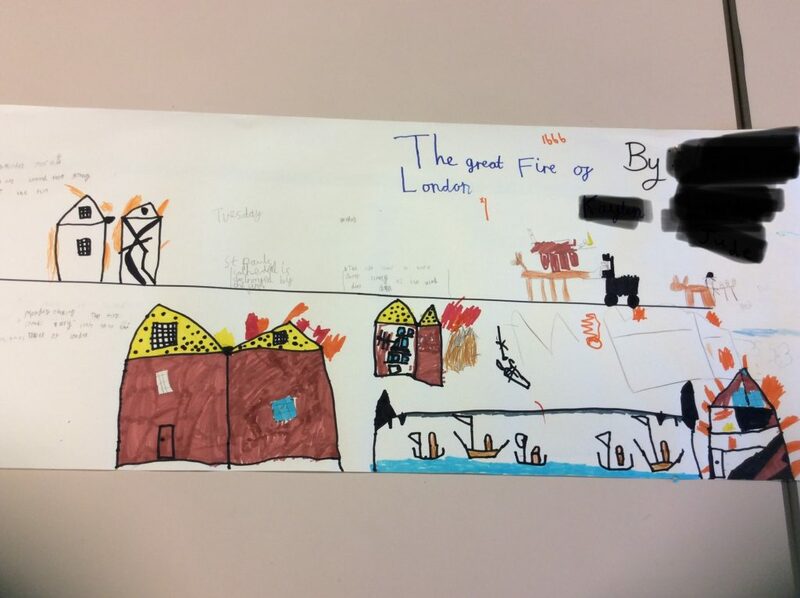 On Monday, we enjoyed a History morning learning all about The Great Fire of London. 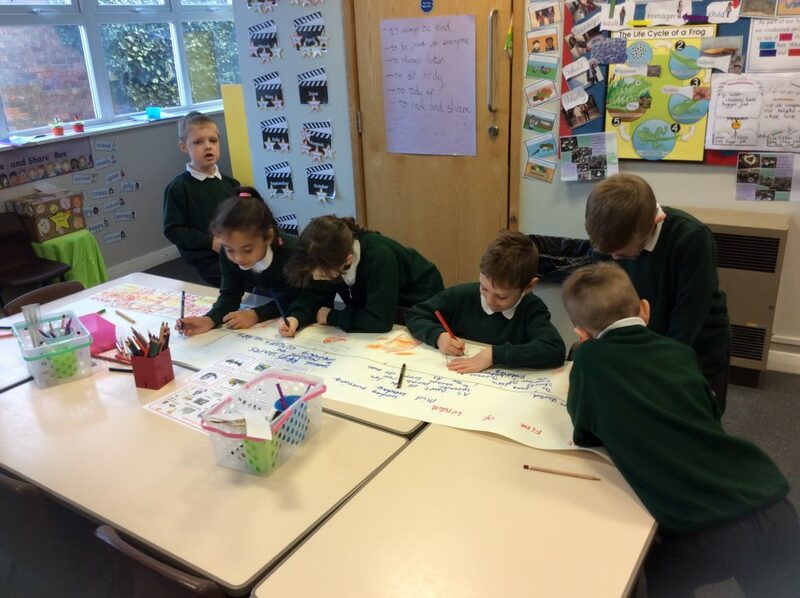 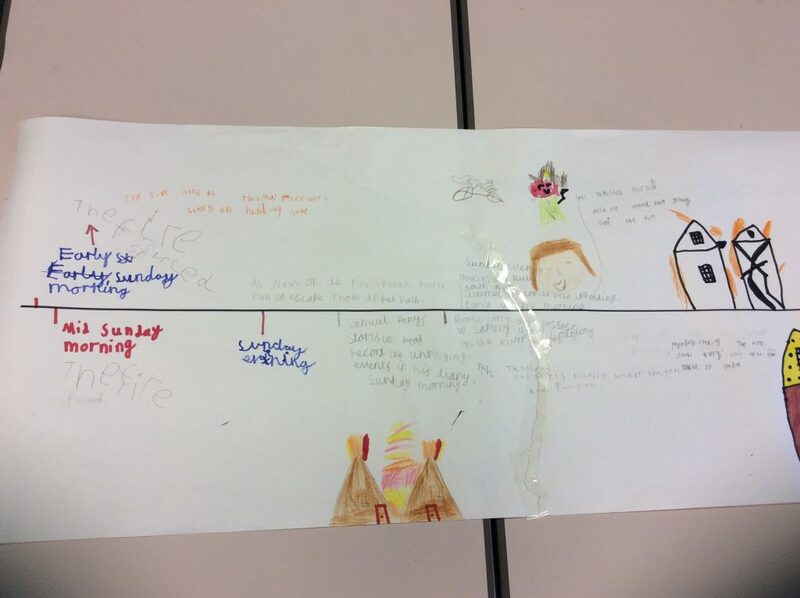 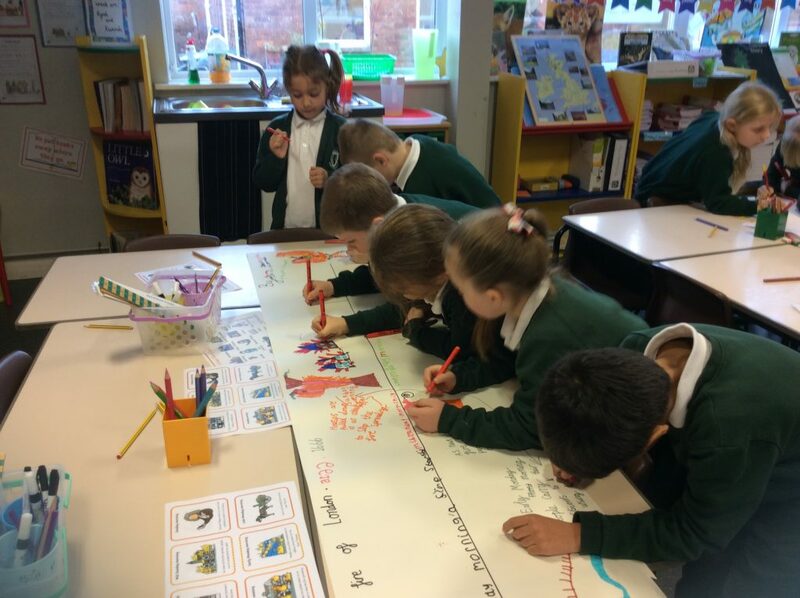 We worked in groups to recreate the timeline of the event, including key facts and some fantastic pictures! 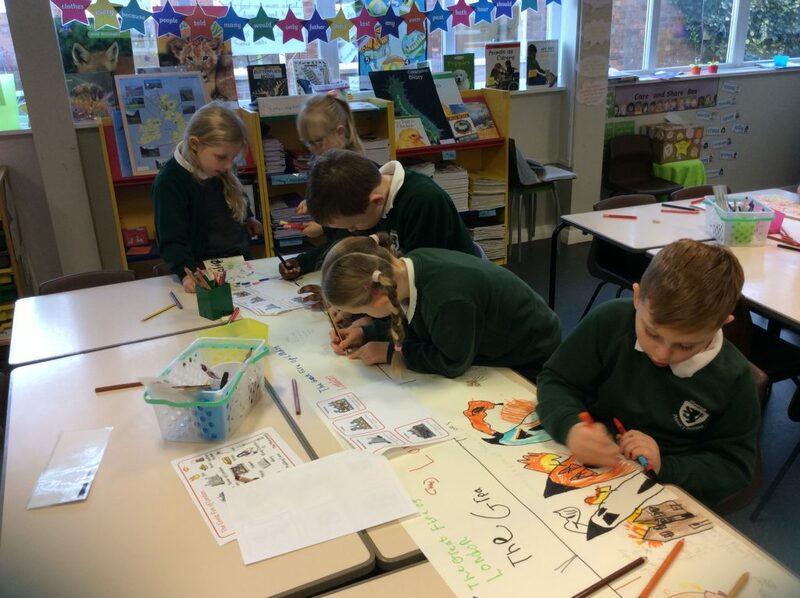 This week we learnt all about Remembrance Day and World War 1. 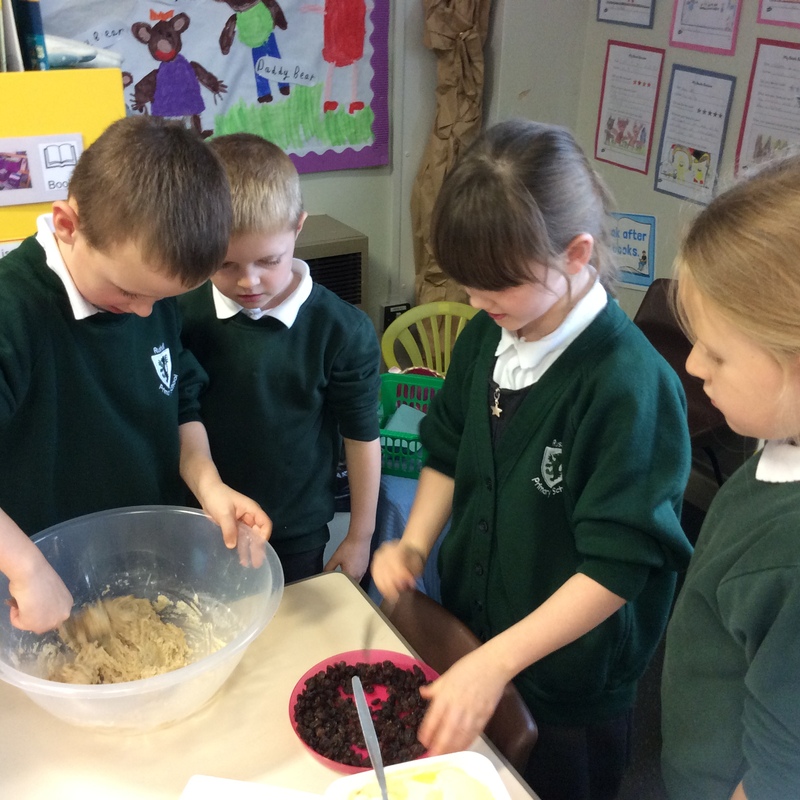 We did some baking using a wartime recipe following ration requirements! 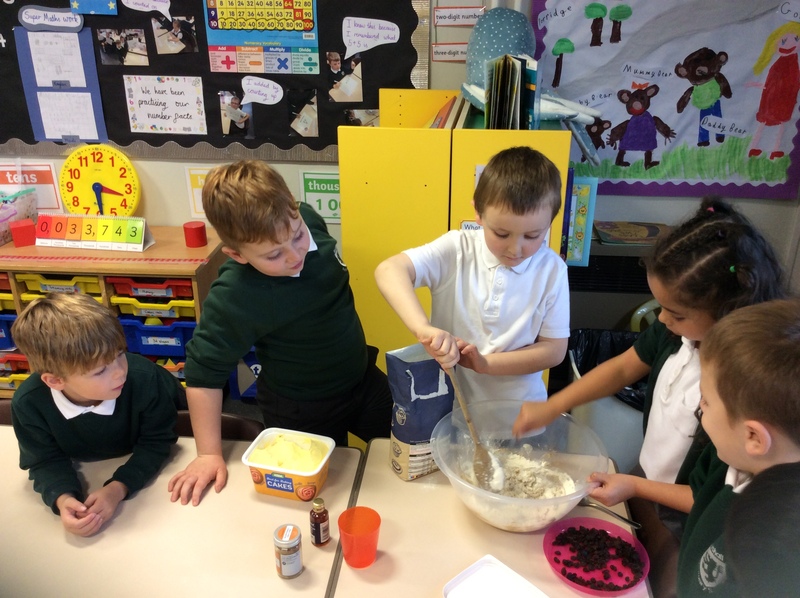 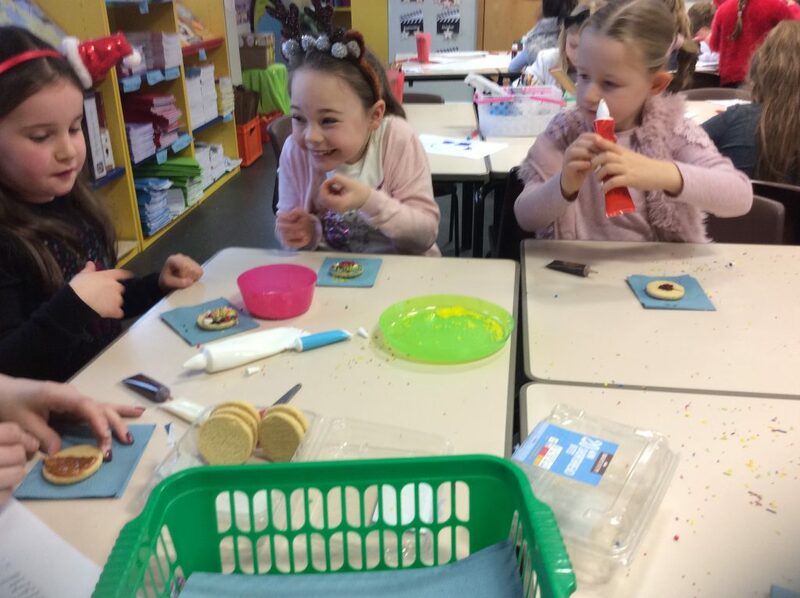 We had lots of fun baking together! 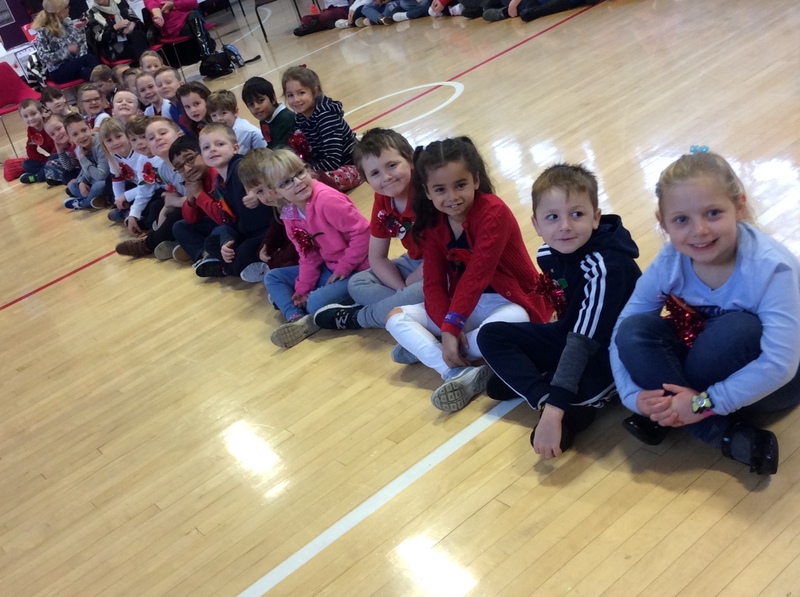 On Friday, we had a special whole school assembly where we performed some wartime songs we have enjoyed practising this week and proudly wore the poppies we had made together. 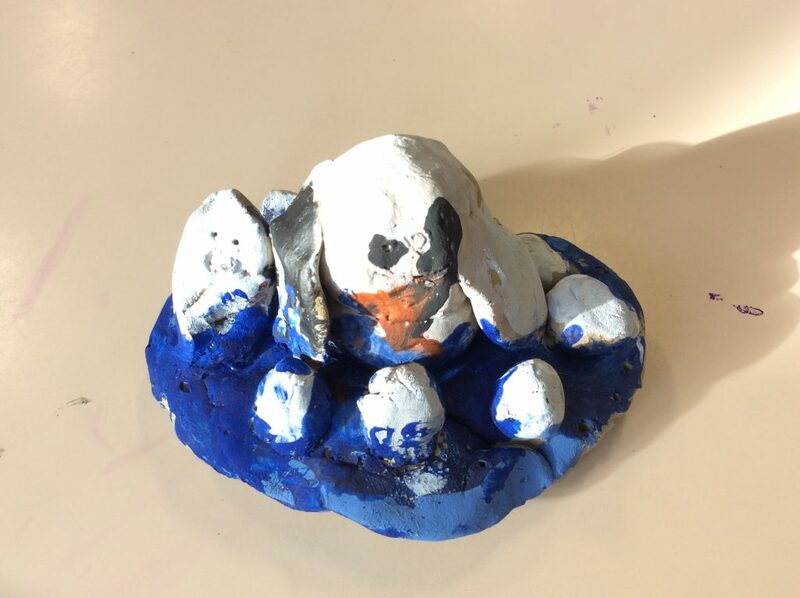 Mrs O'Brien on We found a penguin egg!